VMware provides this operational tutorial to help you with your VMware Workspace ONE® environment. 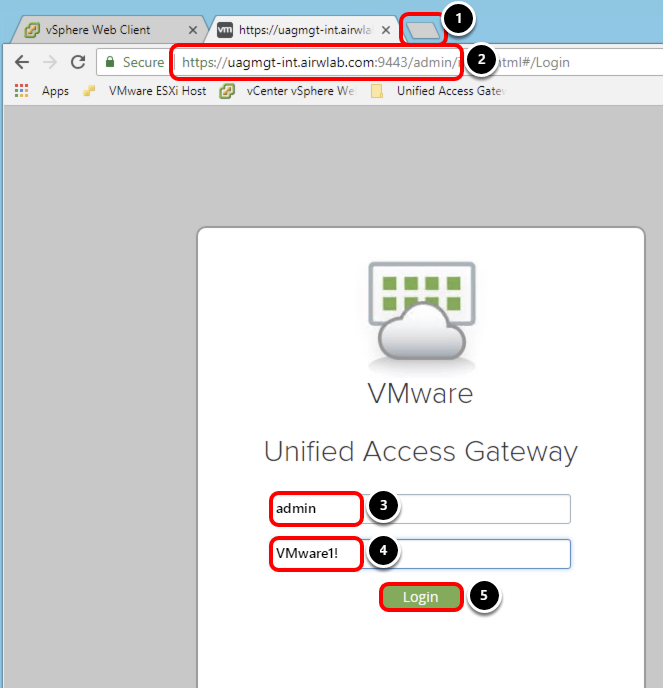 This tutorial walks through configuring VMware Tunnel™ and Content Gateway, which are edge services on VMware Unified Access Gateway™. 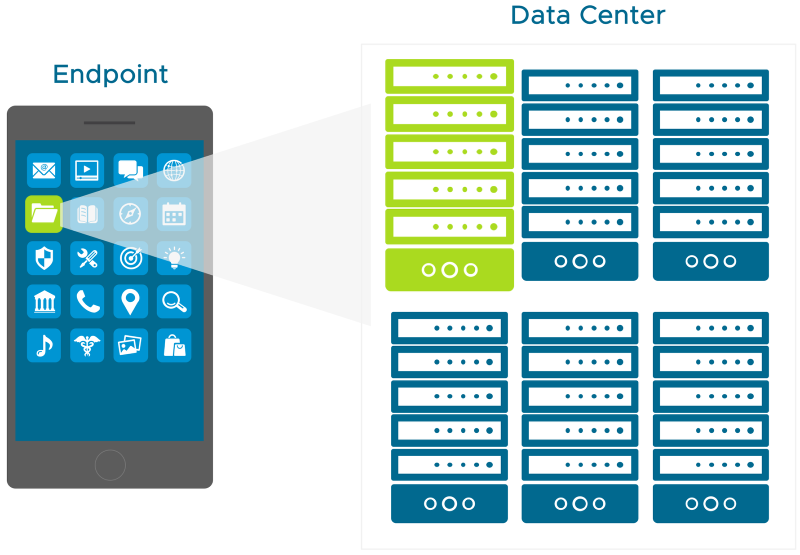 The VMware Tunnel™ is an edge service on VMware Unified Access Gateway™, which enables Per-App VPN on managed mobile devices to secure access to internal resources. VMware Tunnel allows individual applications to authenticate and securely communicate with back end resources over HTTP(S) for proxy and HTTP(S) or TCP for Per-App Tunneling. 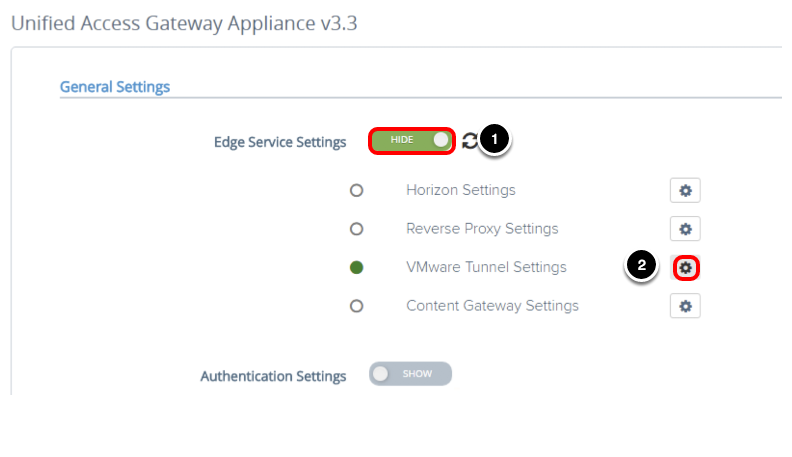 This section helps you to configure the VMware Tunnel edge service on Unified Access Gateway. The steps are sequential and build upon one another, so make sure that you complete each step before going to the next step. 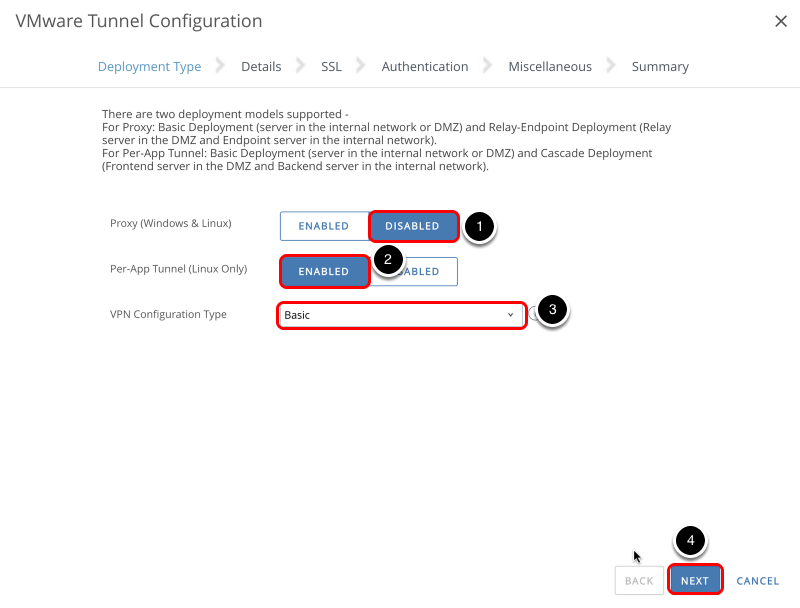 Before deploying Unified Access Gateway with VMware Tunnel, it is important to understand the VMware Tunnel components available to provide secure internal access to your device fleet. VMware Tunnel consists of two major components: Tunnel Proxy and Per-App Tunnel. These components run independently as two separate services on the Unified Access Gateway appliance to enable internal access for an end-user device. 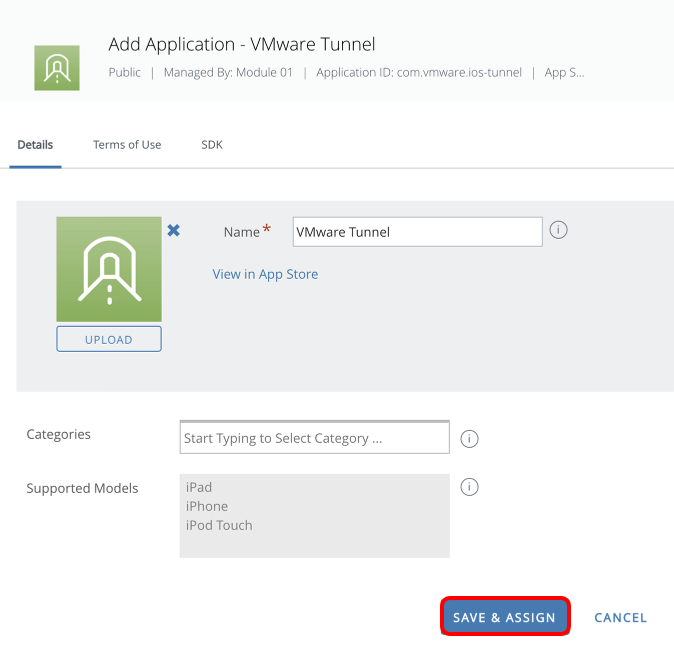 The Tunnel Proxy feature provides internal access to end-users in VMware Workspace ONE® Web (formerly VMware Browser) or other Workspace ONE UEM SDK-enabled applications by securing traffic from the application to a website with SSL encryption and certificate authentication. 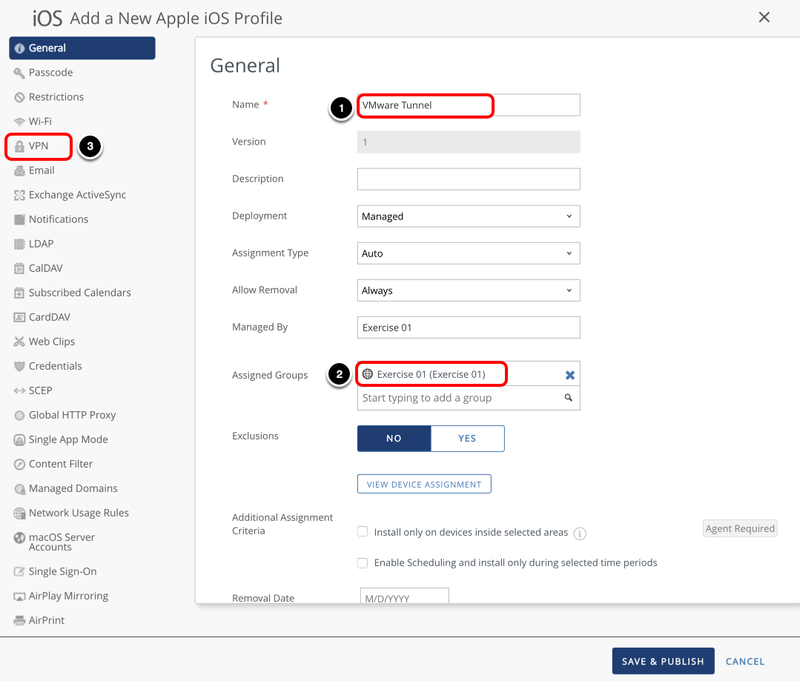 The Tunnel Proxy feature is enabled through settings in an application-specific SDK profile, which is pushed from the Workspace ONE UEM Console with the managed SDK-enabled app. Users also can access internal websites using Workspace ONE Web from non-managed devices, using the Workspace ONE application only in Mobile Application Management (MAM) mode. The Per-App Tunnel feature enables an SSL VPN connection on a per-application basis for any public or internal application. 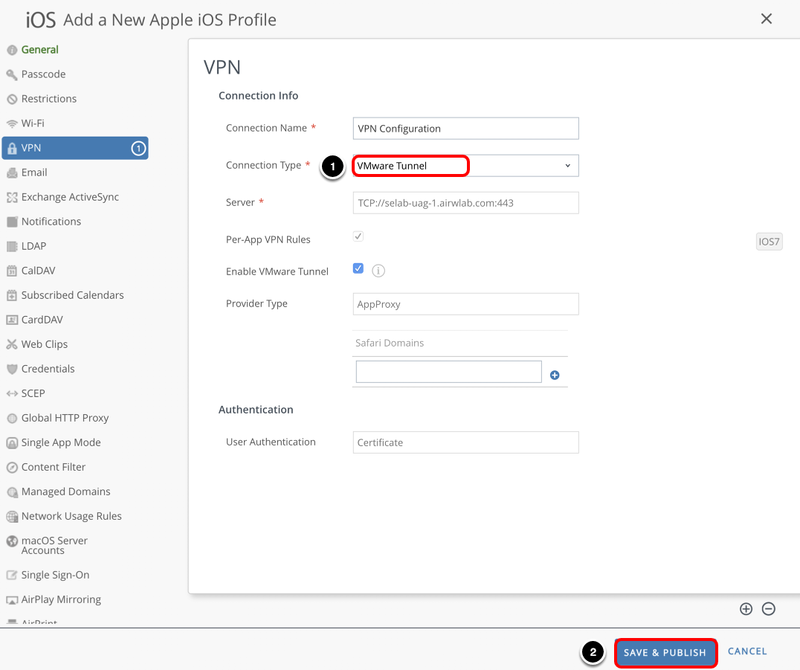 This feature leverages the native Per-App VPN functionality of Android, iOS, and Windows 10 platforms and a device-side VPN client application to initiate a VPN connection when an enabled application is started. 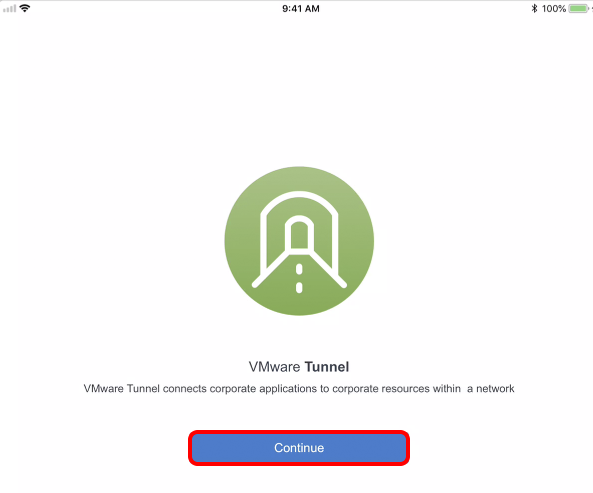 The VMware Workspace ONE® Tunnel client application installed on the user's device maintains a whitelist of applications that should use VPN, handle certificates for enabled applications, and initiate the VPN connection on behalf of the user. Settings for the Per-App Tunnel feature are pushed to the device in a device profile with the VPN payload configured. Each platform offers slightly different variations of the Per-App Tunnel feature, but all platforms require the presence of the Workspace ONE Tunnel client to use Per-App VPN functionality. The VMware Tunnel works as an edge service on Unified Access Gateway, and can automatically be configured during deployment using PowerShell, or after deployment, using the Unified Access Gateway administration console. The Unified Access Gateway appliance OVF template contains several edge services, beyond VMware Tunnel. The template includes Content Gateway, Web Reverse Proxy, and Horizon. The appliance runs from a VMware standard hardened image. 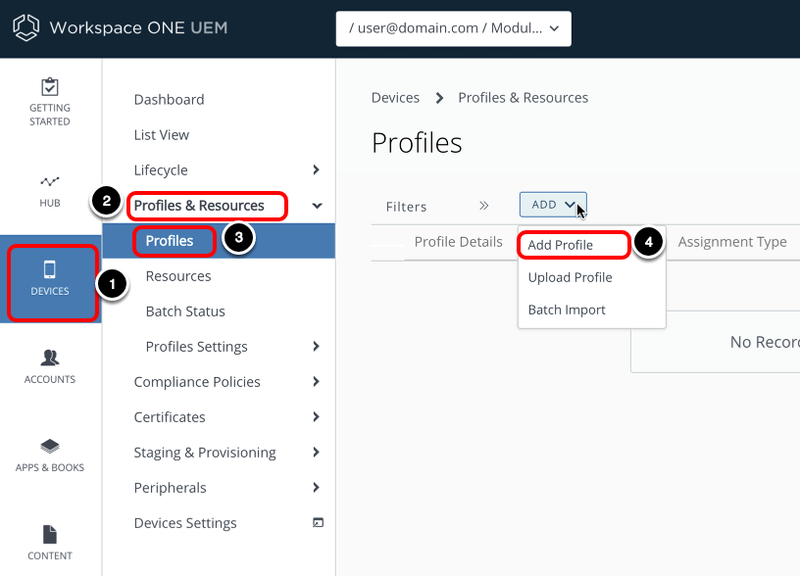 Basic Mode consists of a single Unified Access Gateway appliance, typically situated in the DMZ, where devices can connect to the appropriate port for each feature, authenticate with a certificate issued from the Workspace ONE UEM Console, and connect to internal sites. 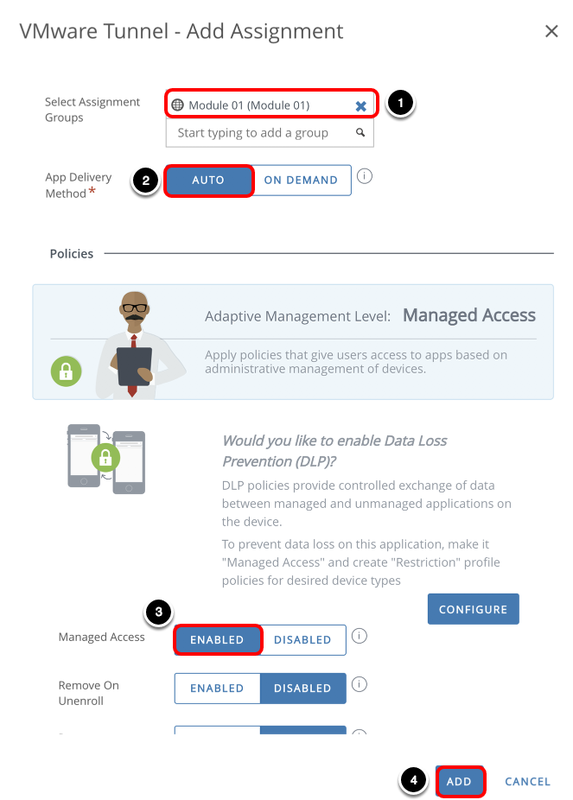 The Cascade Mode option allows devices to authenticate to the front-end tunnel on the Unified Access Gateway appliance located in the DMZ, then connect to the back-end tunnel enabled on another Unified Access Gateway appliance over a single port and then access internal resources. TLS port sharing is an important component on Unified Access Gateway that allows the use of a single port (443) for multiple edge services. It is enabled by default on Unified Access Gateway whenever multiple edge services are configured to use TCP port 443. Supported edge services are VMware Tunnel (Per-App Tunnel component only), Content Gateway, and Web reverse proxy. When enabling Per-App Tunnel and Content Gateway edge services with TLS Port Sharing, a TLS SNI rule is automatically created to forward incoming traffic on port 443 to the edge service port 10443 for Content Gateway and 8443 for Per-App Tunnel, respectively. After that the edge service communicate with the internal resource based on the original request. The Tunnel Proxy edge service does not route through TLS and remains on port 2020. Note: To enable port sharing on TCP port 443, ensure that each configured edge service has a unique external host name pointing to Unified Access Gateway. When port sharing is not enabled, each edge service is assigned to a different port and can use the same external name. The Basic deployment model includes a single Unified Access Gateway appliance, which requires a public host name and a dedicated port for each component. The default port for Tunnel Proxy is 2020 and the default port for Per-App Tunnel is 443. When TLS Port Sharing is disabled, the Per-App Tunnel default port is 8443. These ports are secured with a Workspace ONE UEM-issued tunnel certificate, issued from the device root certificate in your Workspace ONE UEM environment or a public third-party SSL certificate. Note: TLS Port Sharing is enabled by default in Unified Access Gateway 3.3 and later. The Cascade deployment model architecture includes two instances of Unified Access Gateway with VMware Tunnel enabled on each. In cascade mode, the front-end server resides in the DMZ and communicates to the back-end server in your internal network. The Per-App Tunnel requests originate from port 443 when TLS Port Sharing is enabled on the front-end Unified Access Gateway. 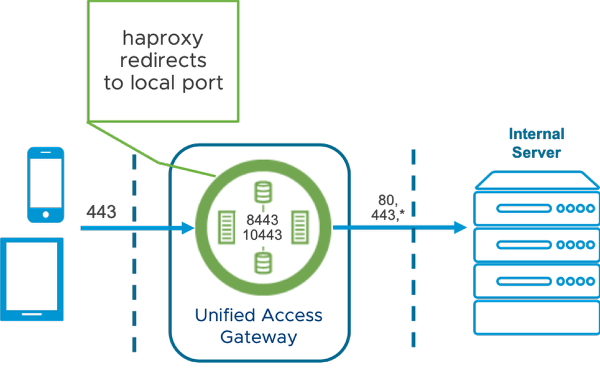 The internal Unified Access Gateway redirects the request to HAProxy, which redirects the request to VMware Tunnel edge service on port 8443. VMware Tunnel authenticates the device and forwards the request to the back-end tunnel, which redirects to the specific internal resource port. Tunnel Proxy requests go through port 2020 at the Tunnel Proxy front-end, which validates the device and forwards traffic to the back-end Tunnel Proxy through port 2010. TLS Port Sharing does not apply to Tunnel Proxy. The architectural diagram below shows an example environment which emulates a typical environment, including DMZ and internal networks. In this example, external requests to the vApp are sent to the vPod Router, which directs those requests to the appropriate resource based on the incoming port. Ports 4000-6500 are reserved for the environment components so all traffic coming in on these ports is forwarded to your Unified Access Gateway appliance's appropriate edge service. In addition, ports 443 and 9443 are forwarded to the Unified Access Gateway appliance over the respective ports. The vApp Networks (internal, DMZ, and transit) are created within the vApp. The internal and transit networks are NATed to the SE-UCS-Network for outbound internet connectivity while the DMZ network routes through the vPodRouter for inbound and outbound access. Note that the vPodRouter does not have a NIC on the Internal network and therefore cannot route external traffic to resources on the internal network. The following architectural diagram shows an example of two major networks that you can deploy your servers into. For this set of exercises, you deploy the Unified Access Gateway appliance on a DMZ and assign the respective NICs. Internal Network: Represents the internal network on 172.16.0.x range. The Control Center, ESXI, and vCenter are part of the internal network. DMZ Network: Represents the DMZ network on 192.168.110.x which is where the Unified Access Gateway appliance is to be deployed. The Unified Access Gateway Internet-facing NIC is associated to this network. The architectural diagram is based on two ports and two host names that route through the F5 load balancer. In this example, non-standard ports are used for these services in the 6000 - 6500 port range, due to F5 configuration for an internal network. 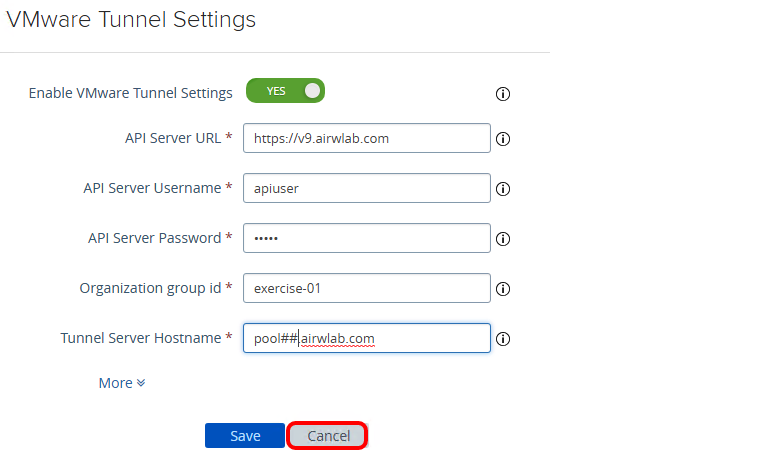 The host names ( pool##.airwlab.com) are CNAMEs that point to the external IP of the F5. When these host names are resolved, they are routed to the F5 to be inspected and forwarded to the internal networks. If the request includes only the host name ( pool##.airwlab.com), the F5 uses the Hostname iRule. This Hostname iRule inspects inbound traffic to the F5 over port 443 (HTTPS). The traffic is decrypted using the *.airwlab.com SSL certificate and chain. The Hostname iRule then inspects the traffic, re-encrypts the traffic using the SSL certificate and chain, and then routes the inbound request to the appropriate destination server based on the host name of the request. This process is known as SSL Bridging, which is not supported by Per-App Tunnel. If the request includes the host name and port ( pool##:airwlab.com:6000), the F5 uses the Port iRule. This Port iRule inspects inbound traffic to the F5 over non-443 ports. Unlike the Hostname iRule, the Port iRule parses the request for the port number and then routes the inbound request to the appropriate destination server based on the port of the request. This process does not involve decrypting or re-encrypting the traffic; it forwards the request to the desired destination. This process uses SSL Passthrough. From the F5 Hostname or Port iRules, the traffic is forwarded to the configured IP address. The vPodRouter is configured to forward Unified Access Gateway traffic to the 192.168.110.20 IP address over the DMZ Network. The Nested DMZ Network (192.168.110.0 on vmnic2) is provided by NIC 2 on the ESXi-01 Host (192.168.110.160). 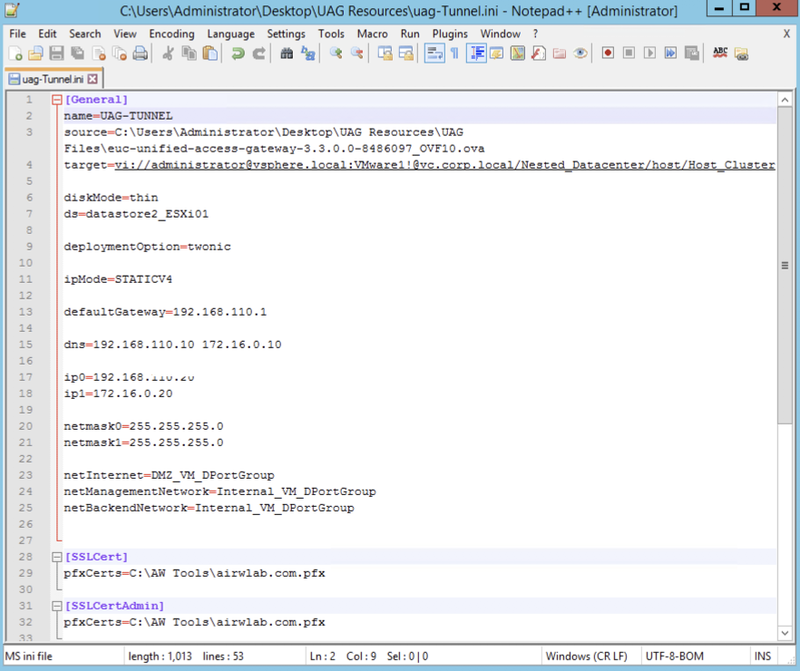 The request reaches the nested Unified Access Gateway appliance deployed on 192.168.110.20. In this example, non-443 ports are used for VMware Tunnel and Content Gateway to avoid decrypting and re-encrypting the traffic because this is not supported with Per-App Tunnel. In other scenarios, you would use the standard ports where possible. This exercise demonstrates that the ports for both services can be configured to work within the architecture. Unified Access Gateway supports deployments with one, two, or three NICs. This means that the server can be partitioned to receive traffic on a single interface or to route traffic to different interfaces, based on the source of the request. Most often, if you need to implement multiple NICs, you already follow this standard with other web applications in your organization. You must determine what is appropriate for your environment when selecting the number of NICs during installation. It is important for you to understand the expected behavior when two or three NICs are enabled. 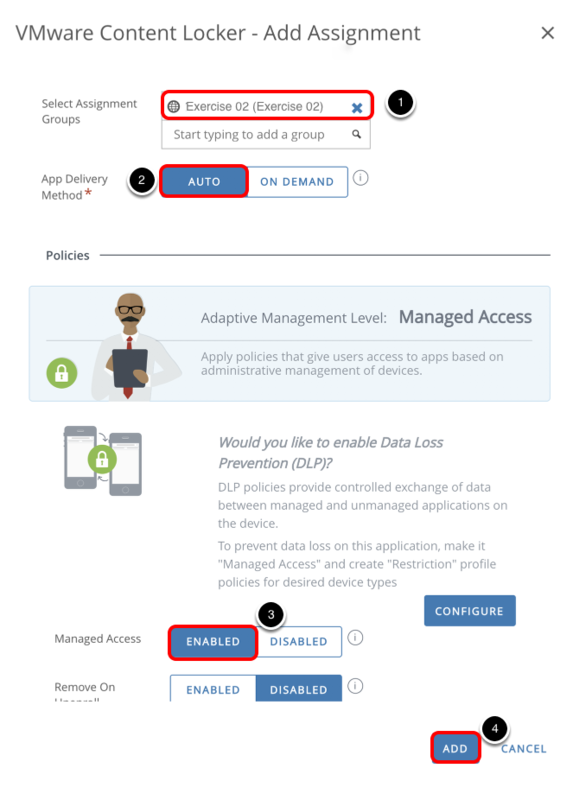 To explore these options, see Deploying VMware Unified Access Gateway: VMware Workspace ONE Operational Tutorial. In the exercises for deploying the Unified Access Gateway server through vSphere, the vCenter setup is hosted in a nested template. This is not usually the case when working with users in a live environment. User environments can include multiple networks and can optionally have a Network Protocol Profiles (NPP) that corresponds to the networks to connect to the Unified Access Gateway. Prior to version 3.3, NPP was a requirement. Since version 3.3, NPP is no longer required. Note: Keep in mind that the Unified Access Gateway requires a netmask, default gateway, and subnet to be defined for each network enabled during deployment. 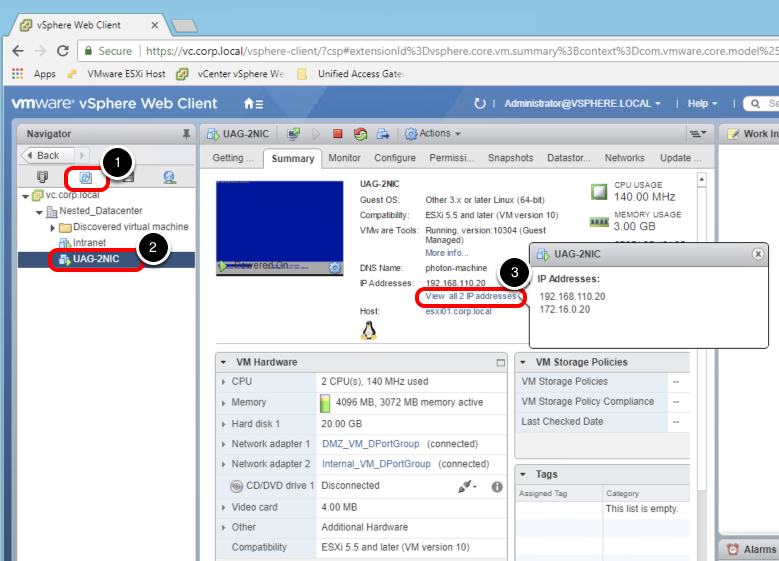 To perform most of this exercise, you need to log in to the vSphere Web Client. Double-click the Google Chrome browser icon on the desktop. Launch the Chrome browser from your desktop and click the bookmark for vSphere. Enter the username, such as administrator@vsphere.local. Enter the password, such as VMware1!. After completing the login, you are presented with the vSphere Web Client. 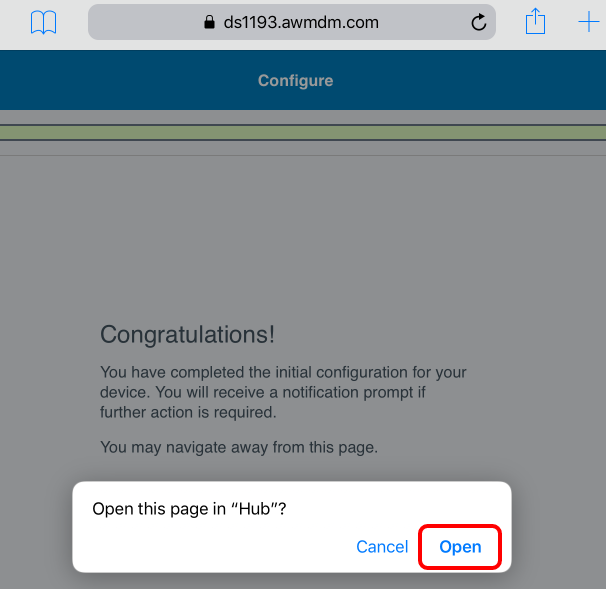 In this section, enroll your iOS device in Workspace ONE UEM by installing the Workspace ONE Intelligent Hub (formerly the AirWatch Agent). A Group ID is required to complete enrollment. 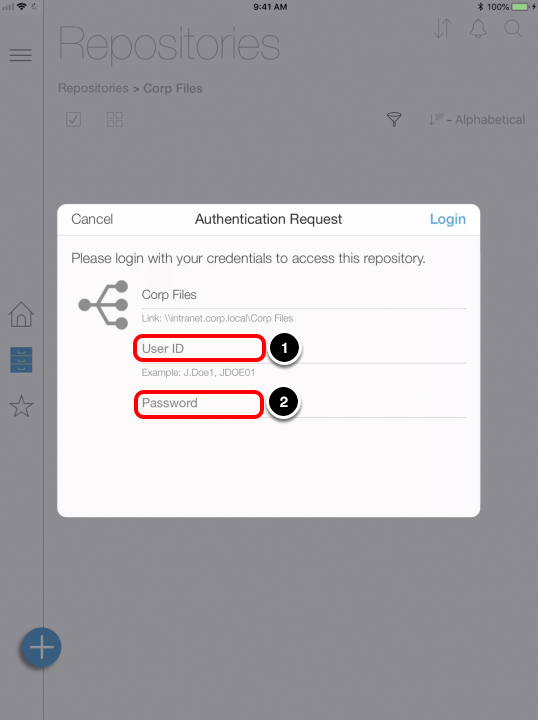 See Retrieving Your Group ID from Workspace ONE UEM Console. NOTE: Checked out devices will likely have the Workspace ONE Intelligent Hub already installed. You may skip this step if your device has the Workspace ONE Intelligent Hub installed. 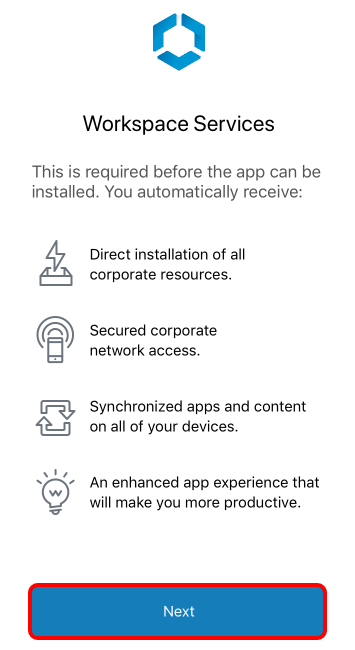 At this point, if you are using your own iOS device or if the device you are using does not have the Workspace ONE Intelligent Hub Application installed, then install the application from the App Store. 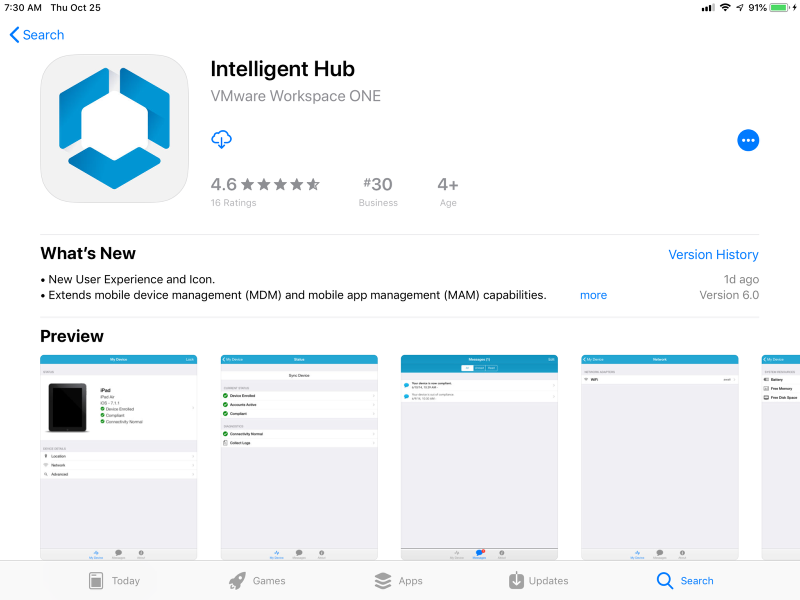 To install the Workspace ONE Intelligent Hub application from the App Store, open the App Store application and download the free Workspace ONE Intelligent Hub application. NOTE: If you have your own iOS device and would like to test, you must download the Workspace ONE Intelligent Hub app first. 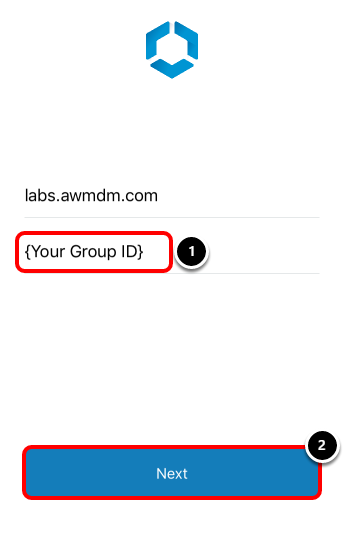 Enter your Group ID for your Organization Group for the Group ID field. 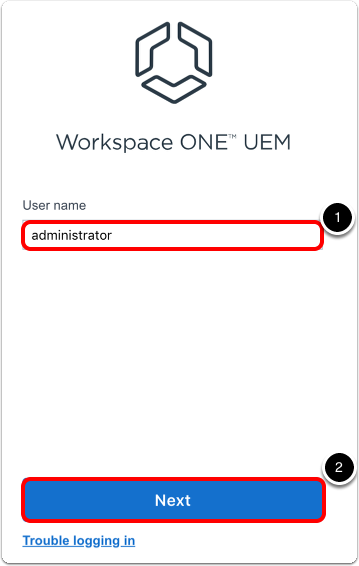 See Retrieving Your Group ID from Workspace ONE UEM Console. NOTE: If on an iPhone, you may have to close the keyboard by clicking Done in order to click the Next button. 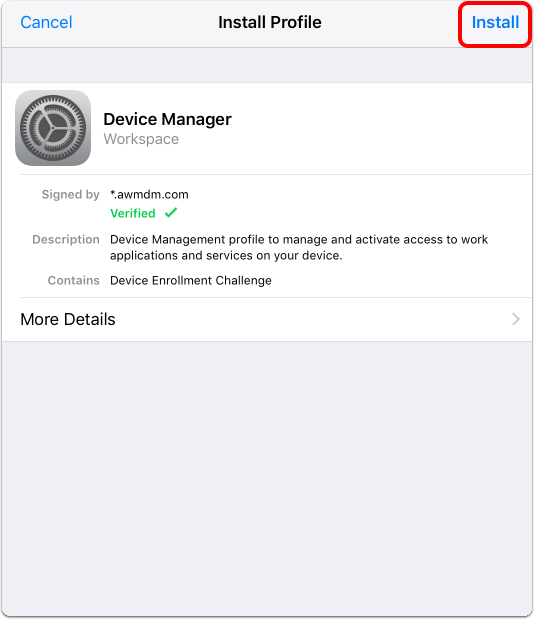 The Workspace ONE Intelligent Hub prompts you to enable Workspace Services to enroll your device into Workspace ONE UEM. 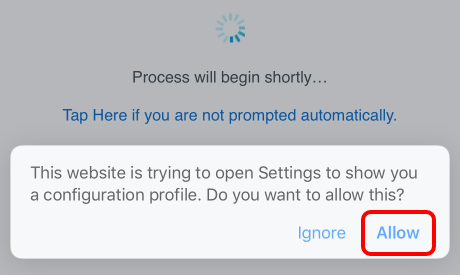 If you are prompted to allow the website to open Settings, tap Allow. NOTE: If you do not see this prompt, ignore this and continue to the next step. This prompt occurs only for iOS devices on iOS 10.3.3 or later. Tap Install in the upper-right corner of the Install Profile dialog box. Tap Install when prompted on the Install Profile dialog. You should now see the iOS Profile Installation warning explaining what this profile installation will allow on the iOS device. Tap Install in the upper-right corner of the screen. 11. Trust the Remote Management Profile. 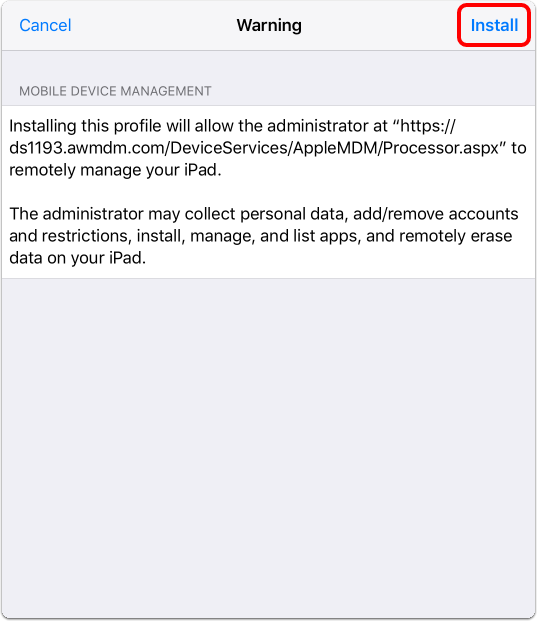 You should now see the iOS request to trust the source of the MDM profile. 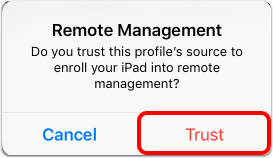 Tap Trust when prompted at the Remote Management dialog. You should now see that the iOS Profile was successfully installed. Tap Done in the upper-right corner of the prompt. Your enrollment is now complete. Tap Open to navigate to the Workspace ONE Intelligent Hub. Tap Done to confirm the notice and continue. 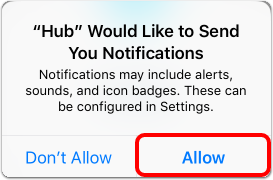 Tap Allow if you get a prompt to allow notifications for the Hub app. You may be prompted to install a series of applications. 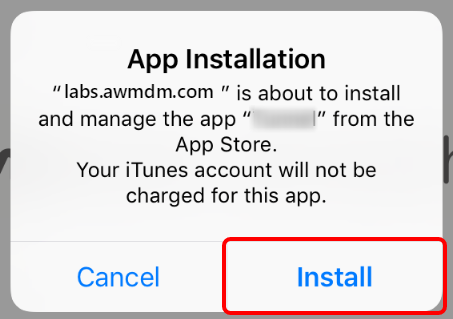 If prompted, tap Install to accept the application installation. 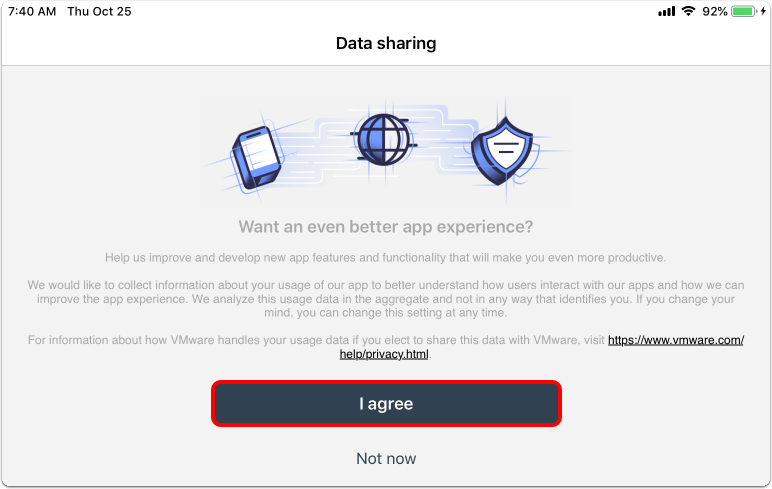 Tap I Agree for the Data Sharing policy. Confirm that the Hub app shows the user account that you enrolled with. 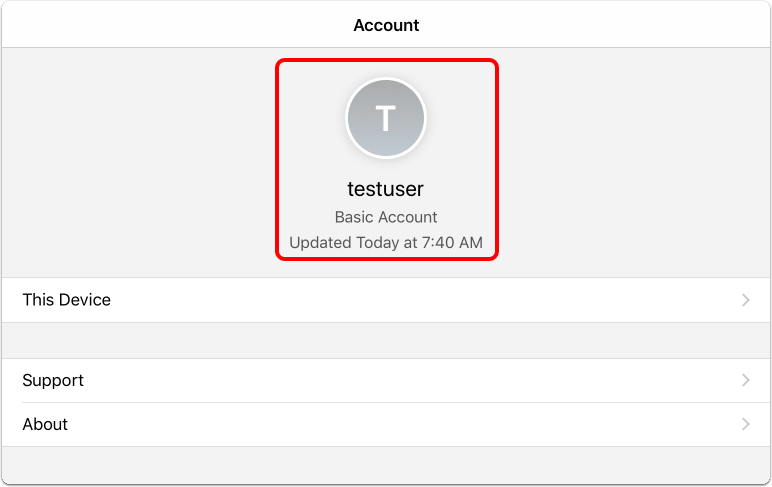 You have now successfully enrolled your iOS device with Workspace ONE UEM. Continue to the next step. 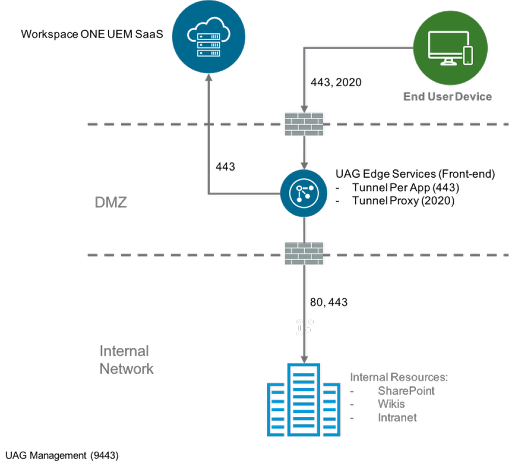 When the VMware Tunnel edge service is enabled on the Unified Access Gateway appliance, it retrieves the VMware Tunnel configuration from Workspace ONE UEM. 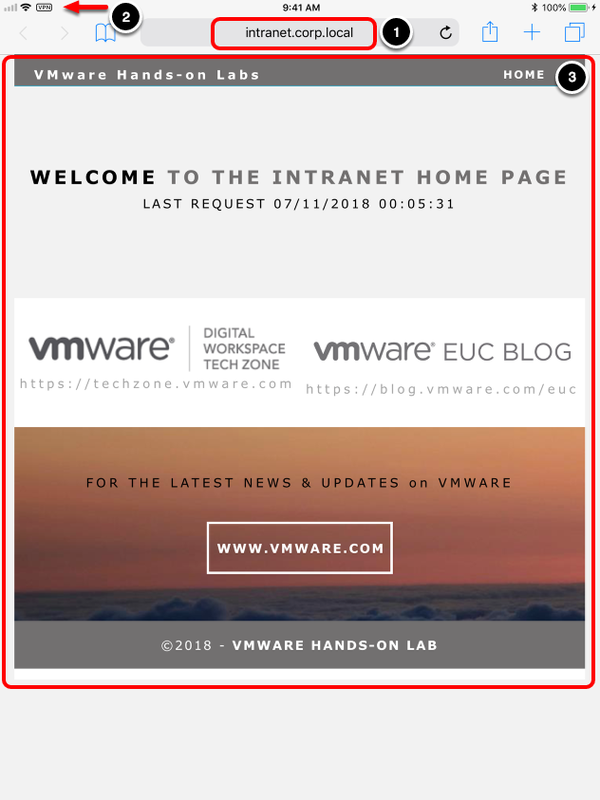 Therefore, the VMware Tunnel must be configured first in the Workspace ONE UEM Console, prior to deployment of the Unified Access Gateway appliance. 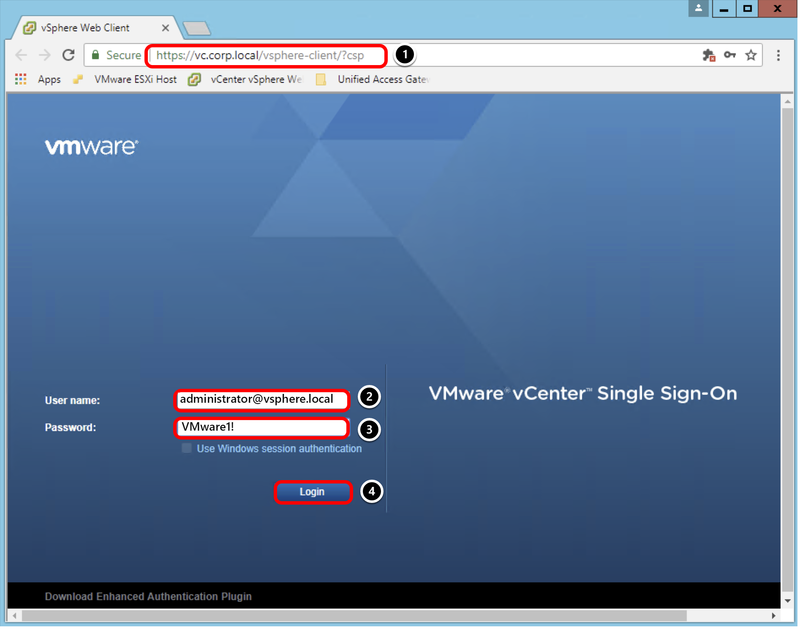 This section helps you to configure VMware Tunnel in the Workspace ONE UEM Console. Change the setting to Override. Select Enabled for VMware Tunnel. Select Disabled for Proxy (Windows & Linux). Select Enabled for Per-App Tunnel (Linux Only). Select Basic (Single-Tier) from the drop-down menu for VPN Configuration Type. The Unified Access Gateway appliance is deployed on a DMZ where the VMware Tunnel edge service is enabled to communicate with the internal network. 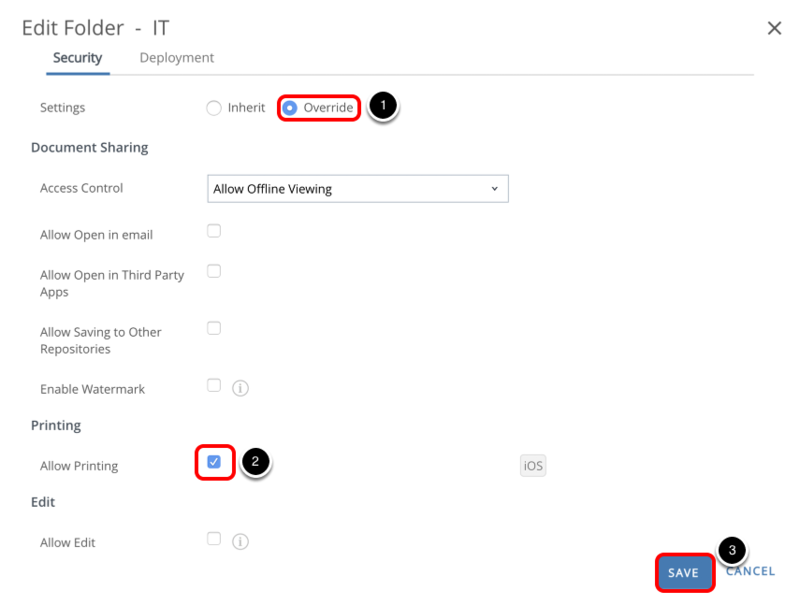 Enabling the Proxy option allows access to internal websites exclusively through Workspace ONE Web, which uses port 2020 to communicate with the front-end appliance. In this exercise, Proxy is not enabled. Enter the VMware Tunnel server host name for Hostname. Ensure Use Public SSL Certificate is selected. Click Upload and navigate to your certificate. This example uses the airwlab.pfx file in C:\AW Tools. Select Disabled for Access Logs. Select Disabled for NSX Communication. Verify that the configuration summary is correct. Click Save to continue. After the configuration is saved, click Download the Unified Access Gateway to download the virtual appliance. Extract the ZIP file on the Windows machine where you will install Unified Access Gateway. The next section helps you to deploy the Unified Access Gateway appliance OVF through PowerShell and configure VMware Tunnel edge services based on the settings configured in Workspace ONE UEM. 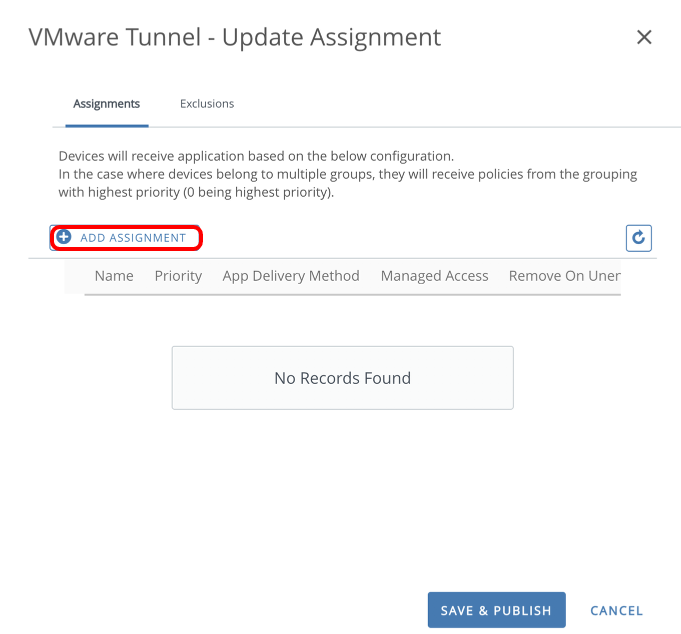 This section covers the required INI settings to enable the VMware Tunnel edge service during the Unified Access Gateway appliance deployment. Ensure you are logged in to the machine where you will install Unified Access Gateway. Extract the contents of the Unified Access Gateway ZIP file on this machine. The INI file contains all the configuration settings required to deploy the Unified Access Gateway appliance. This exercise uses the uag-Tunnel.ini file and is configured for a Unified Access Gateway appliance called UAG-TUNNEL, that has two NICs—NIC one is set to internet facing and NIC two for back end and management. The INI file is located in the Unified Access Gateway installer ZIP package downloaded in the previous exercise. Navigate to your Unified Access Gateway INI file. 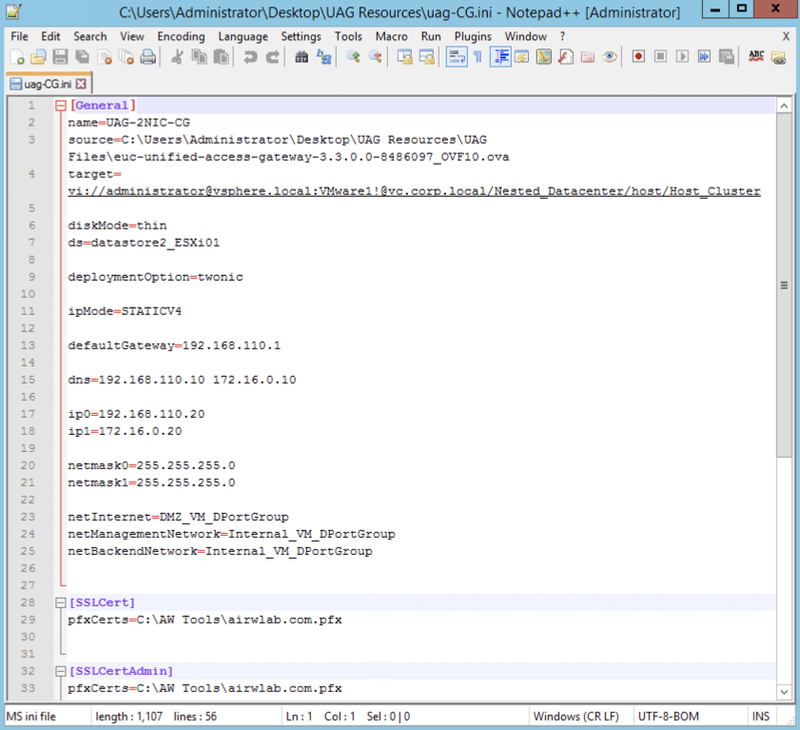 In this example, the INI file is located in UAG Resources. Click the File Explorer icon from the task bar. Right-click the INI file, for example, uag-TUNNEL.ini. In this example, the settings are already filled out. The General section includes details such as deployment location and network configuration for the Unified Access Gateway appliance. The SSLCert and SSLCertAdmin sections contain SSL certificate location for the administrator and Internet interfaces. 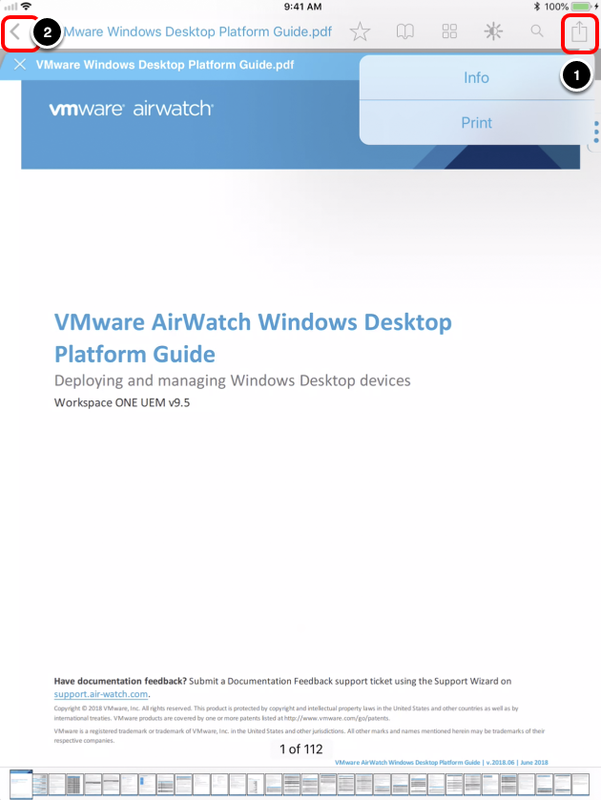 The AirWatch section contains the required parameters to enable the VMware Tunnel edge service on your Unified Access Gateway appliance. Enter the apiServerUsername, for example, apiuser. Enter your Group ID for the Organization Group. 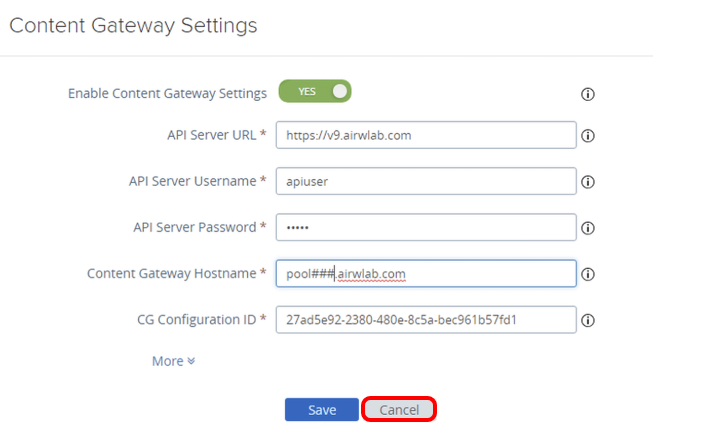 Enter the apiServerUrl, for example, https://v9.airwlab.com. 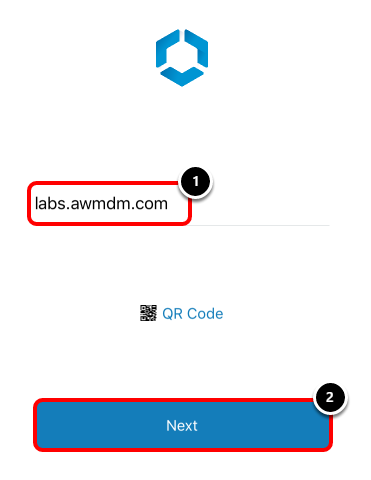 Enter the airwatchServerHostname, for example, https://pool##.airwlab.com. During the Unified Access Gateway deployment, the PowerShell script prompts you for the apiServerUsername password. After you have configured the INI file for your Unified Access Gateway deployment, the next step is to run the PowerShell script passing the INI as a parameter. After you run the script, it prompts for input. Navigate to the folder containing your INI file. 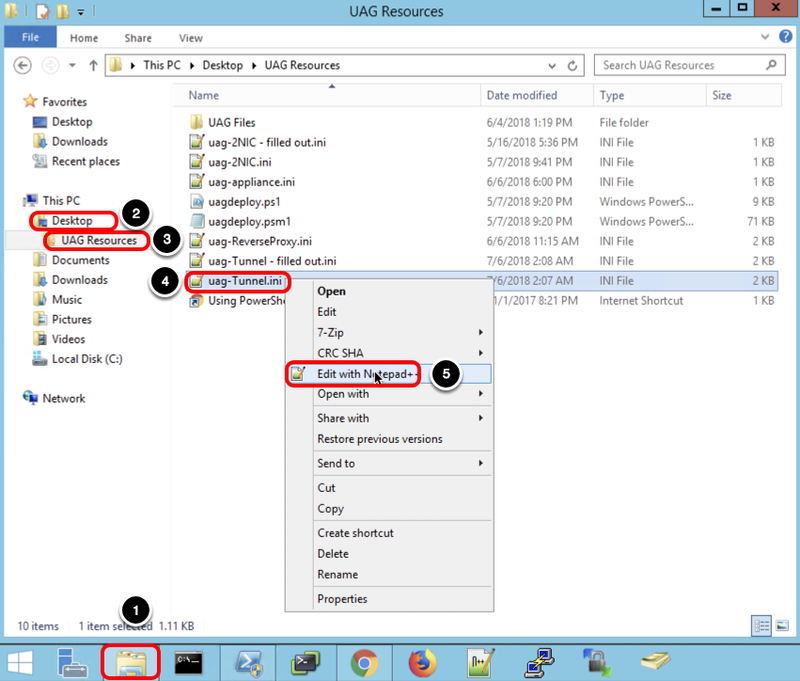 For example, enter cd '.\Desktop\UAG Resources' then press Enter. Enter .\uagdeploy.ps1 .\<uag-tunnel>.ini <password1> <password2> false false no then press Enter. Replace <uag-tunnel> with your INI file name. Replace <password1> with the root password for the Unified Access Gateway appliance. Replace <password2> with the administrator password for REST API management access. The first false is to not skip the validation of signature and certificate. The second false is to not skip SSL verification for the vSphere connection. 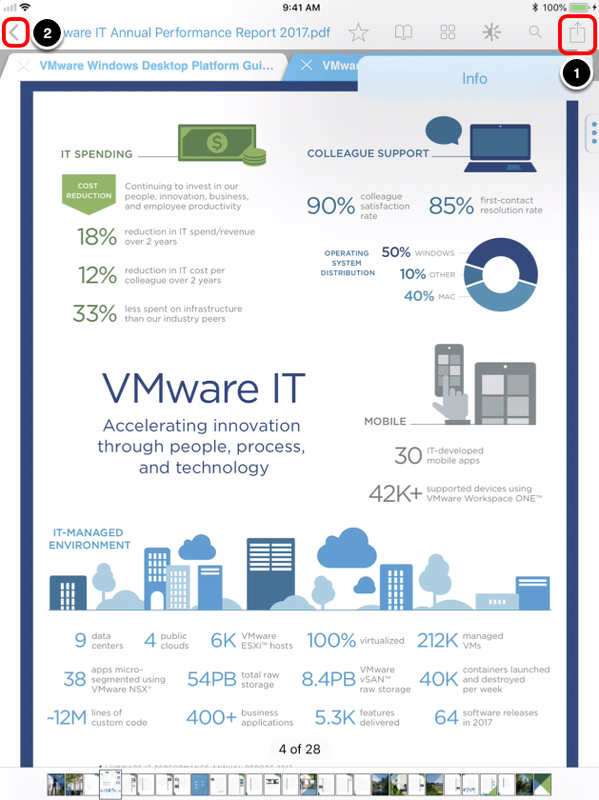 The no is to not join the VMware CEIP program. Enter the password for the certificated that will be used on the following fields SSLcert and SSLcertAdmin. Enter the password for the apiuser previous defined on the INI file, which will allow Unified Access Gateway to obtain the VMware Tunnel settings from Workspace ONE UEM. To avoid a password request for the certificate, remove the pfxCert values and provide a PEM certificate in the INI file. Set the pemCerts and pemPrivKey for the SSLCert and SSLCertAdmin sections in the INI file. The deployment starts and you can follow the progress in the same window or on your vSphere Web Client. Confirm the deployment has been completed successfully. The Completed successfully text is shown in the output. After a successful deployment, the script automatically powers on the VM UAG-2NIC-TUNNEL. The Received IP address presented by the script log is a temporary IP; the final IPs for NIC one and NIC two are assigned to the Unified Access Gateway appliance during the first start. Return to the vSphere Web Client and validate the IP address in the next step. Click your VM, for example, UAG-2NIC. Click View all 2 IP addresses. Important: If the Unified Access Gateway appliance does not finalize the configuration during the first startup, you receive an error message from vSphere Web Client. If that happens, wait for the appliance to finalize, and refresh the entire Google Chrome browser. 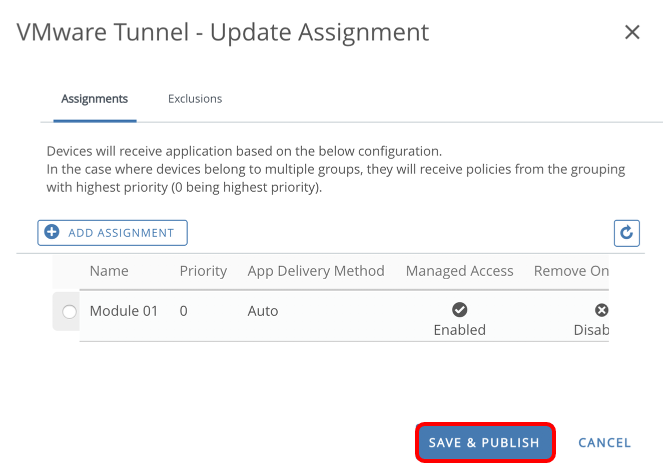 The VMware Tunnel is now enabled and running based on the INI settings that you provided during the Unified Access Gateway deployment. As an alternative to deploying the VMware Tunnel using PowerShell, you can use the Unified Access Gateway administration console, which allows you to enable or change the current VMware Tunnel settings. 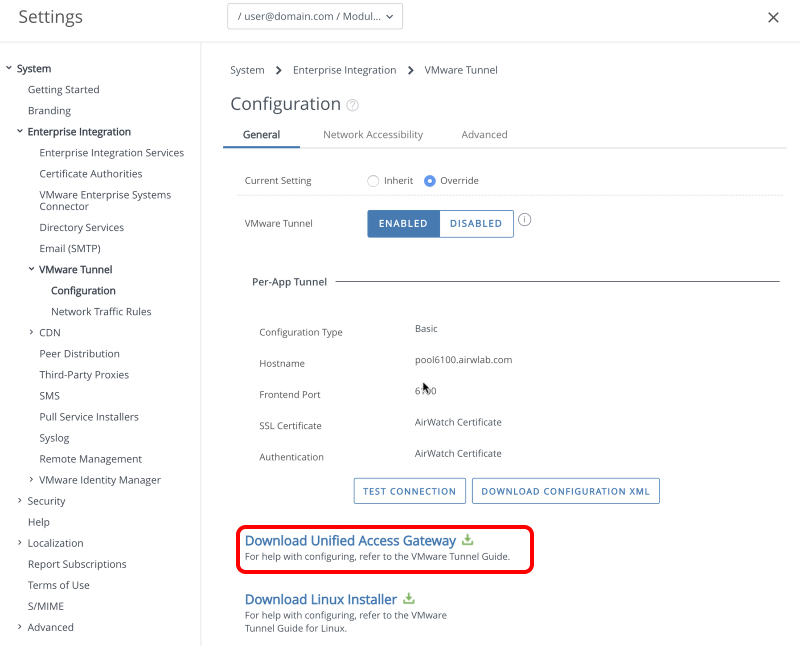 This section helps you to validate the VMware Tunnel settings using the Unified Access Gateway administration console. Click the New Tab button to open a new tab. 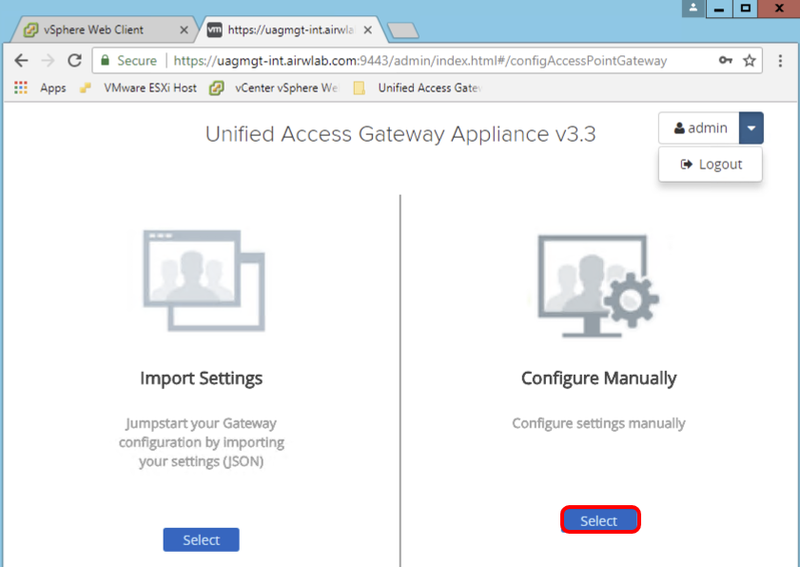 Navigate to the Unified Access Gateway administration console URL, for example, https://uagmgt-int.airwlab.com:9443/admin. Enter the username, for example, admin . Enter the password, for example, VMware1!. A successful login redirects you to the following screen. Keep this window open as you will return to the administration console later. Click Select to configure settings manually. Click SHOW, after you click SHOW, it changes to HIDE. Click the gear icon next to VMware Tunnel Settings. The circle should be green, which means the Unified Access Gateway appliance and Workspace ONE UEM Console can communicate. The VMware Tunnel edge service is enabled based on the configuration defined in the INI file. You can change the configuration any time, or choose not to configure settings in the INI file and later enable the settings through the Unified Access Gateway administration console. 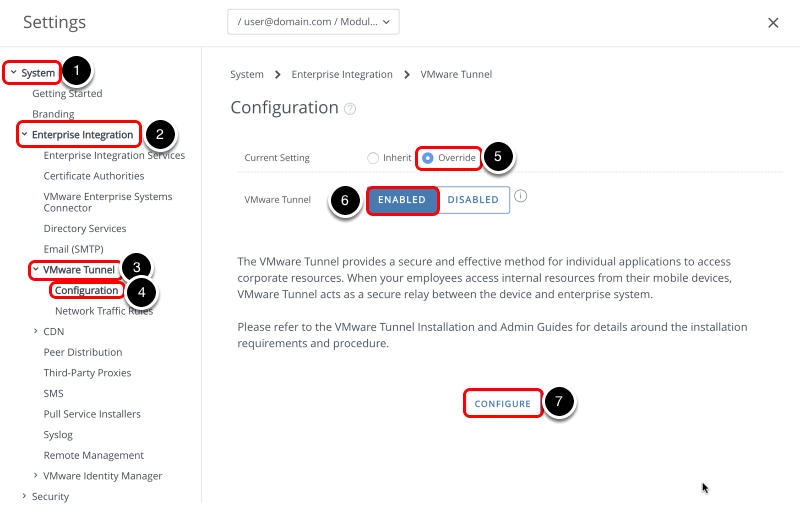 Each time you change the configuration and Save, the changes are applied to the configuration files and the VMware Tunnel edge service restarts automatically. Devices cannot communicate with the service during the restart. 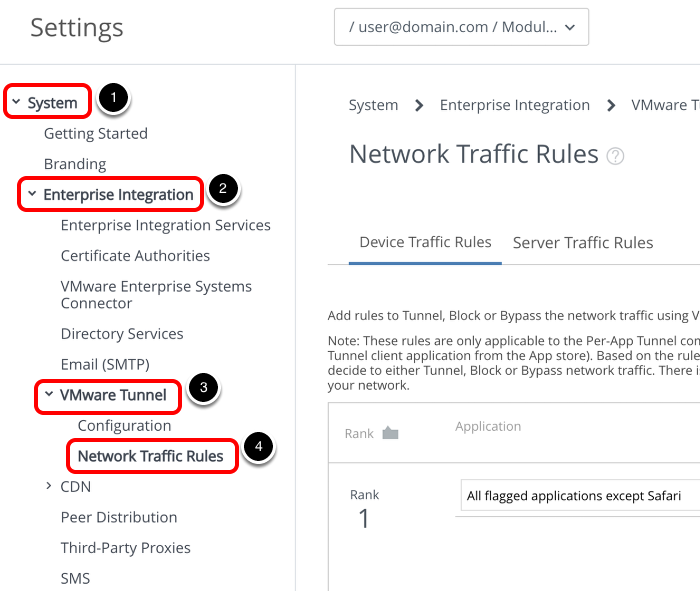 From Workspace ONE UEM Console, you can define network traffic rules to granularly control how the VMware Tunnel and Workspace ONE Tunnel app directs traffic from devices. The configuration in this exercise applies to the Per-App Tunnel component. Device traffic rules control how devices handle traffic from specified applications and server traffic rules manage network traffic when you have third-party proxies configured. The device traffic rules are created and ranked to give an order of execution. Every time a specified application is opened, the Workspace ONE Tunnel application checks the list of rules to determine which rule applies to the situation. If no set rules match, Workspace ONE Tunnel applies the default action. The default action—set for all applications except Safari—applies to domains not mentioned in a rule. If no rules are specified, the default action applies to all domains. 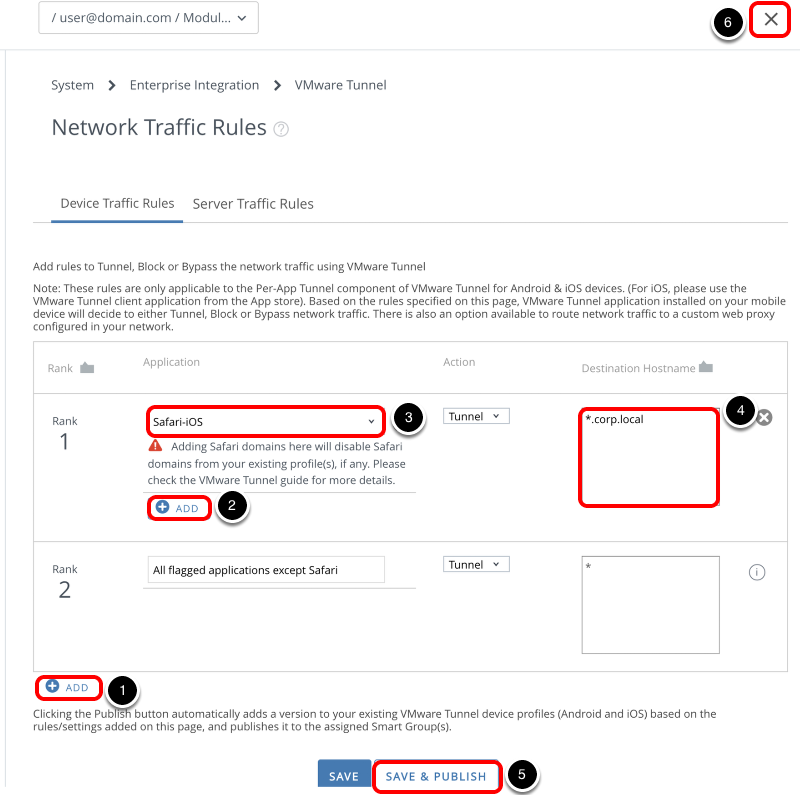 The device traffic rules created apply to all VPN VMware Tunnel profiles in the organization group that the rules are created in. Server traffic rules enable you to manage the network traffic when you have third-party proxies configured in your network. These rules apply to traffic originating from the VMware Tunnel. The rules force the VMware Tunnel to send traffic to specific destinations either through the proxy or to bypass it. 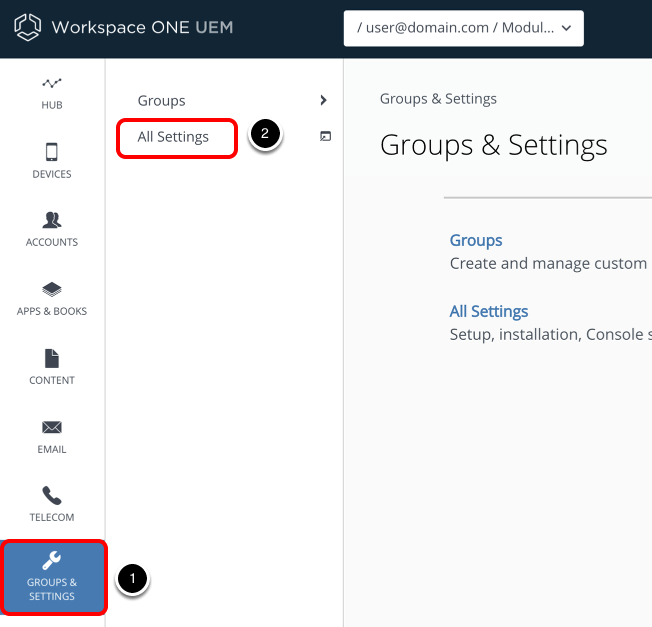 In the Workspace ONE UEM Console, select GROUPS & SETTINGS. In this step, you create a specific rule that is applied only to Safari; any requests to *.corp.local are routed through the VMware Tunnel. All other requests are not routed through VMware Tunnel. Enter a Destination Hostname, for example, *.corp.local. The message Device Traffic Rules Published! displays in the console. To provide Per-App VPN capability on the devices, you must send a VPN profile and Workspace ONE Tunnel client to the devices. This exercise helps you to create and push the VPN Profile to the device. Click Add, then click Add Profile. Enter a Name, for example, VMware Tunnel. Select and Assigned Group, for example, Exercise 01. Click Save & Publish and on the next screen, click Publish. 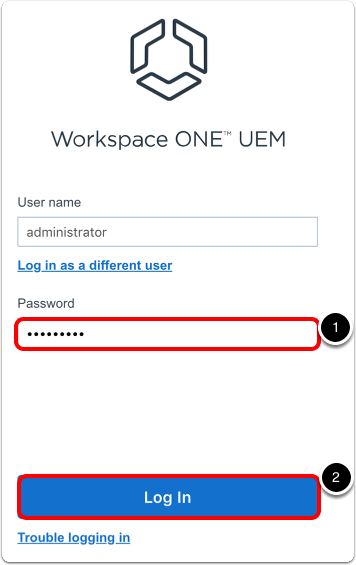 This exercise helps you to configure the Workspace ONE Tunnel client application to be deployed to your device through Workspace ONE UEM. Select Apple iOS as Platform. Enter VMware Tunnel for Name. 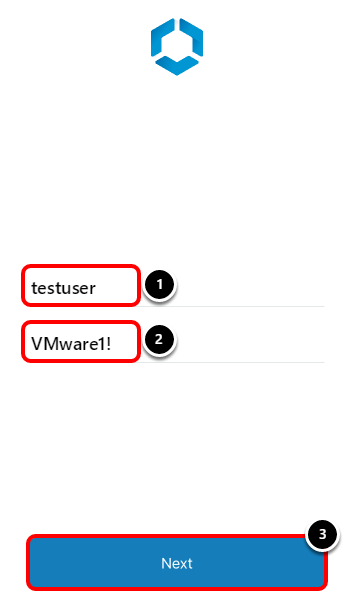 Click Select for VMware Tunnel. Select an Assignment Group, for example, Module 01. Select AUTO for App Delivery Method. Select Enabled for Managed Access. After you click Save & Publish, you should see a prompt on your device requesting your confirmation to install the Workspace ONE Tunnel application. Confirm and launch the application after the installation is complete. The application searches for the VPN profile that you just created. If the VPN profile does not exist on the device yet, the application will request it. Repeat the steps in this exercise, this time for the Google Chrome application. Google Chrome is used later in this exercise to confirm that Safari is the only browser authorized to access internal websites. After enrollment is complete, ensure that the Workspace ONE Tunnel and Google Chrome applications are installed on your iOS device. 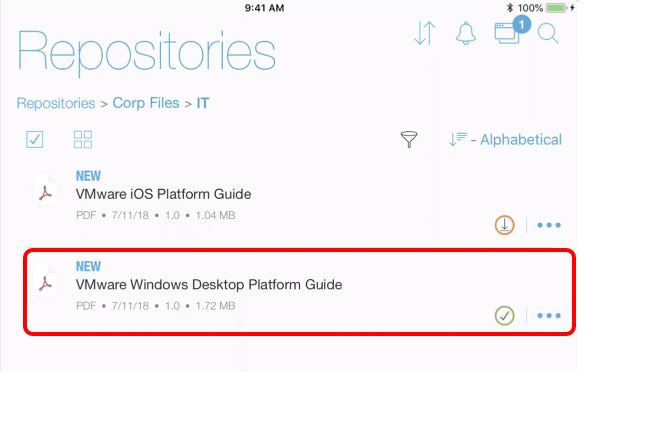 On your iOS device, tap Tunnel to start the Workspace ONE Tunnel client. 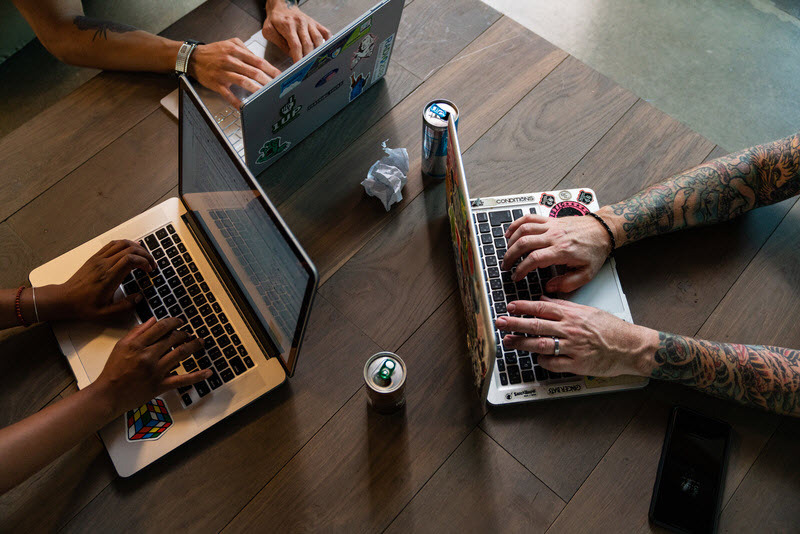 This step enables the newly-installed Workspace ONE Tunnel client to initiate a VPN connection automatically on behalf of the user whenever an enabled application is launched. You perform this step only once. 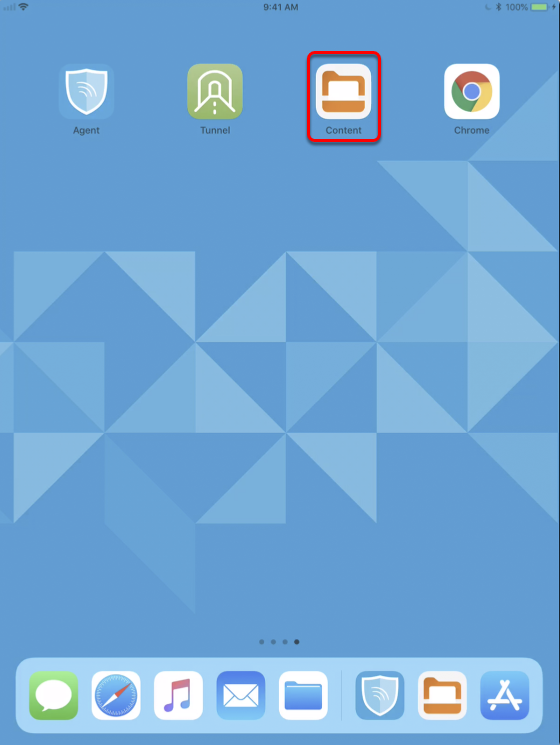 Tap Continue to enable the Workspace ONE Tunnel application as a VPN client on the device. 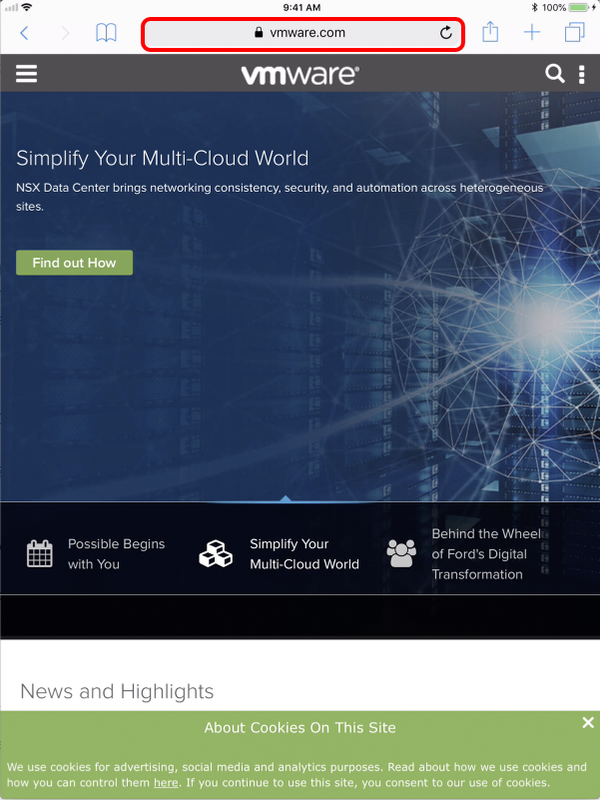 You can access the VMware website and no VPN is requested. Navigate to an internal website, for example, http://intranet.corp.local/intranet. You should see a VPN icon, indicating the connection is active. The Workspace ONE Tunnel client application identified a rule that applies to this situation, which you created in Define Device Traffic Rules. The website should load successfully. Next, verify that you cannot access the intranet from other browsers, even though the VPN connection is active for Safari. Note that VPN is not active. You should see an error message stating This site can't be reached. The website is published to an internal DNS that can only be accessed when using the VPN connection. 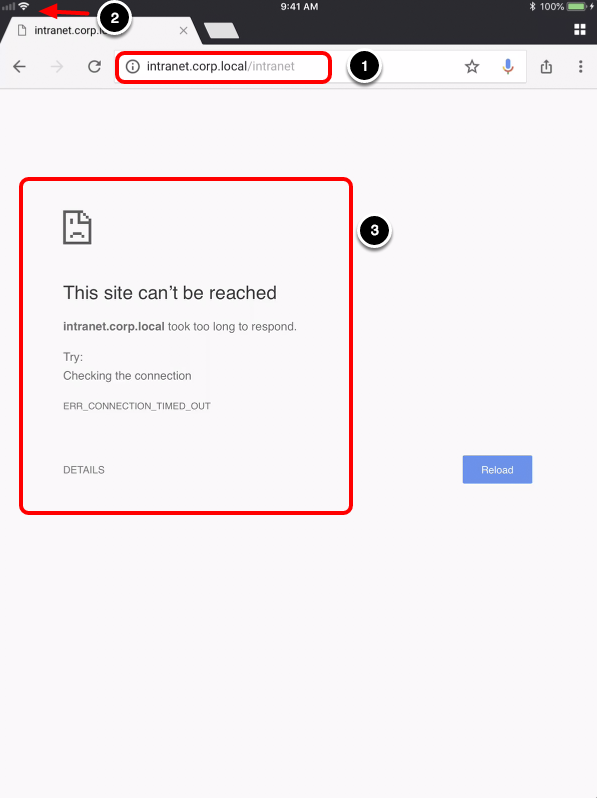 The website does not load for Google Chrome because the device traffic rule configured allows access to the internal domain only through the Safari browser. Safari is enabled to initiate Per-App VPN Tunnel only for the domains configured in the device traffic rules. The Content Gateway provides a secure and effective method for end users to access internal repositories. 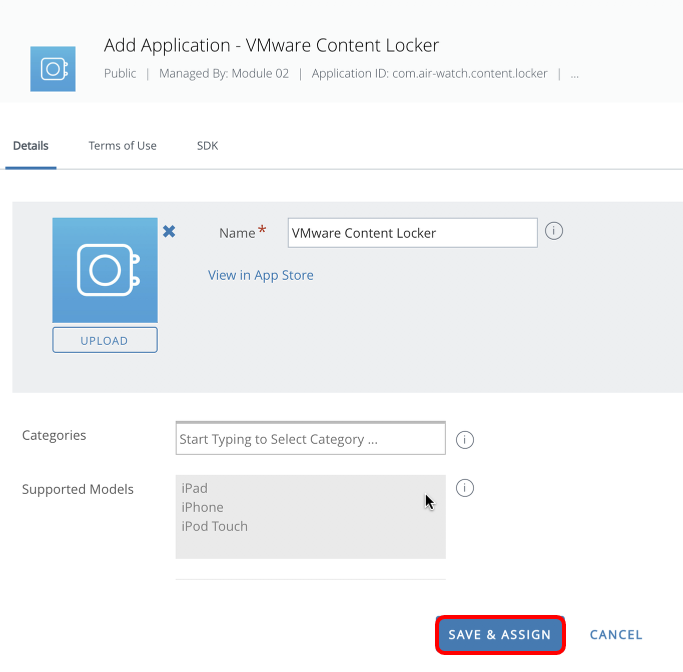 Using Content Gateway with VMware Workspace ONE® Content (formerly Content Locker) provides levels of access to your corporate content. End users can remotely access their documentation, financial documents, board books, and more, directly from content repositories or internal file shares. 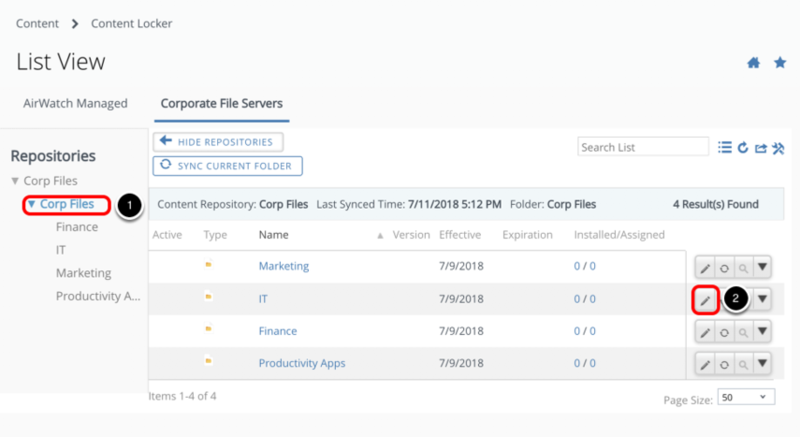 As files are added or updated within your existing content repository, the changes immediately display in Workspace ONE Content. Users are granted access to their approved files and folders based on the existing access control lists defined in your internal repository. Workspace ONE Content not only provides access to on-premises content repositories, but also enables users to have access to multiple cloud repositories. This section helps you to configure the Content Gateway edge service on Unified Access Gateway. Before deploying the Unified Access Gateway with Content Gateway, it is important to understand the Content Gateway architecture and deployment models available to provide secure internal access to file repositories from your device fleet. The Content Gateway works as a edge service on the Unified Access Gateway appliance, and can be configured automatically during deployment of the appliance using PowerShell or after deployment, using the Unified Access Gateway administration console. The Unified Access Gateway appliance OVF template product, contains several edge services, beyond Content Gateway. The template includes VMware Tunnel, Web Reverse Proxy, and Horizon. This appliance runs from a VMware standard hardened image. The Cascade Mode option allows devices to authenticate to the front-end Content Gateway on the Unified Access Gateway appliance located in the DMZ, then connect to the back-end Content Gateway enabled on another Unified Access Gateway appliance over a single port and then access internal resources. The Basic deployment model includes a single Unified Access Gateway appliance, as you can enable VMware Tunnel on port 443 as well, VMware Tunnel and Content Gateway require distinct host names on the Unified Access Gateway appliance. The default port for Content Gateway is 443 as TLS Port Sharing is enabled by default on Unified Access Gateway. When TLS Port Sharing is disabled, Content Gateway listens on port 10443. These ports are secured with a public third-party SSL certificate, which includes the subject name of the server host name. The Cascade deployment model architecture includes two instances of Unified Access Gateway with Content Gateway enabled on each. In cascade mode, the front-end server resides in the DMZ and communicates to the back-end server in your internal network. The Content Gateway requests originate from port 443 when TLS Port Sharing is enabled on the front-end Unified Access Gateway, and forward the traffic to the Content Gateway service on local port 10443. As the back-end appliance receives the incoming traffic and use 443, it will perform the same local redirect mentioned on item #1 and then access the internal resource request by the device/users. 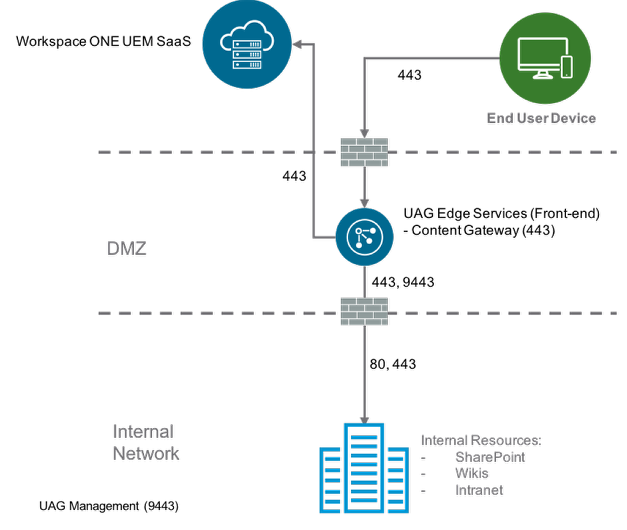 When the Content Gateway edge service is enabled on the Unified Access Gateway appliance, it retrieves the Content Gateway configuration from Workspace ONE UEM. 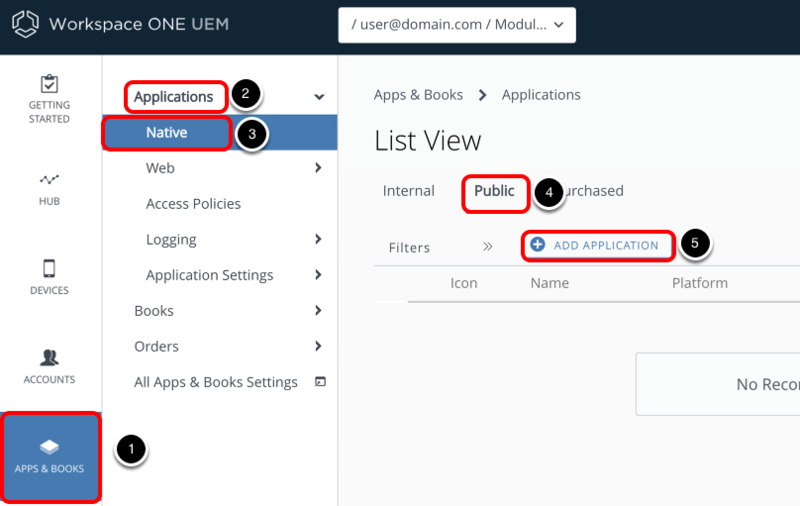 Therefore, the Content Gateway must be configured first in the Workspace ONE UEM Console, prior to deployment of the Unified Access Gateway appliance. 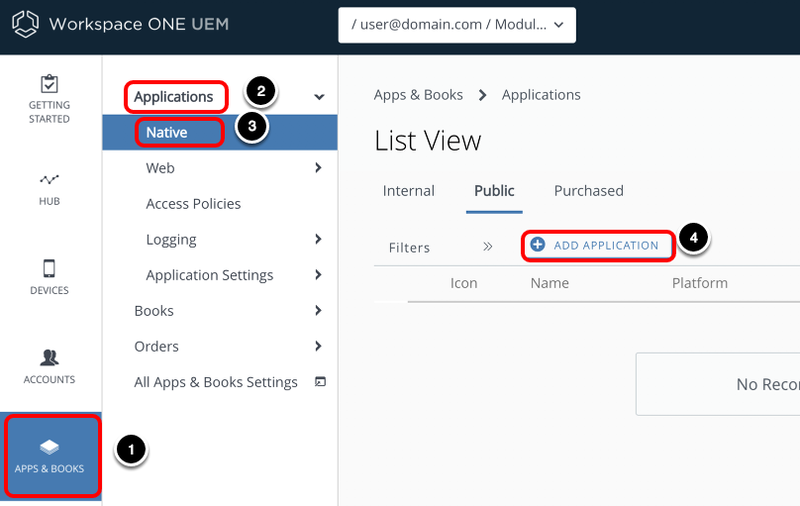 This section helps you to configure Content Gateway in Workspace ONE UEM Console. Select Enabled for Content Gateway. Select UAG for Installation Type. Select Basic (Single-Tier) for Choose Configuration Type. Enter a Name, for example, Content Gateway on UAG. Enter the Content Gateway server host name (for example, https://contentgateway.vmware.com) for Content Gateway Endpoint Address. Enter a port number for Content Gateway Endpoint Port. Click Upload and select your certificate. Select the Content Gateway configuration that you just added. Select More Actions and select Download Unified Access Gateway, which redirects to the Workspace ONE Resources portal where the Unified Access Gateway virtual appliance OVF package is hosted. 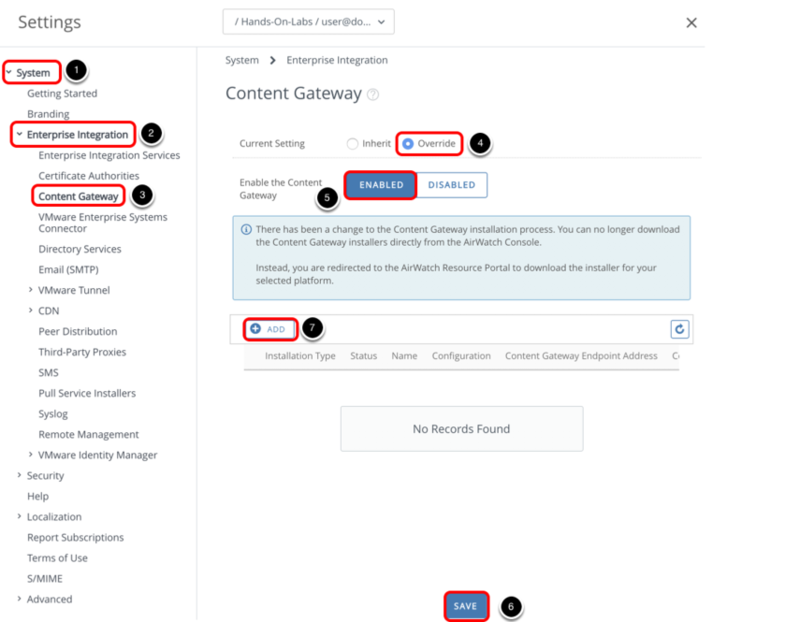 Copy the Content Gateway Configuration GUID—this is required to enable the Content Gateway edge service on Unified Acces Gateway. 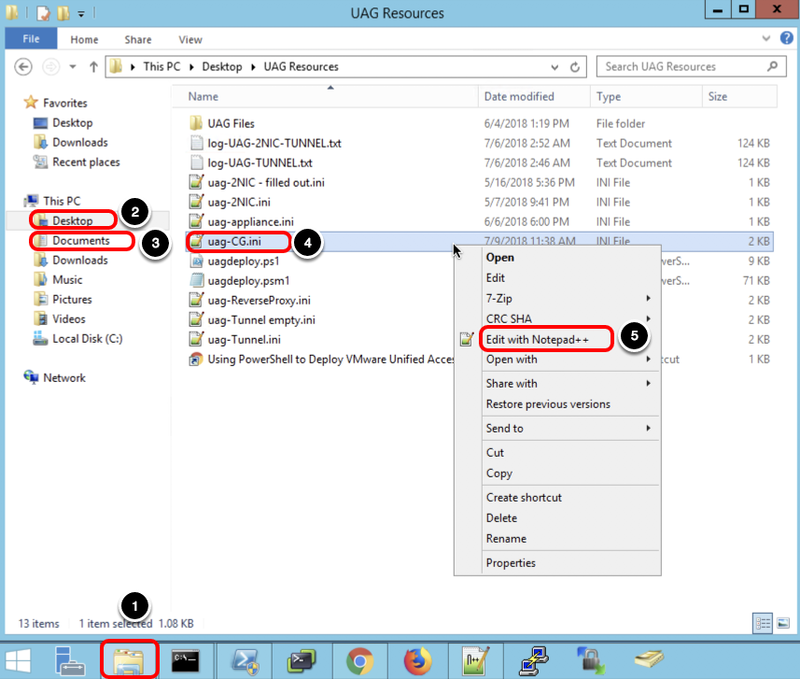 Extract the ZIP file on the Windows machine where you will install Unified Access Gateway. The next section helps you to deploy the Unified Access Gateway appliance OVF through PowerShell and configure the Content Gateway edge service based on the settings configured in Workspace ONE UEM. 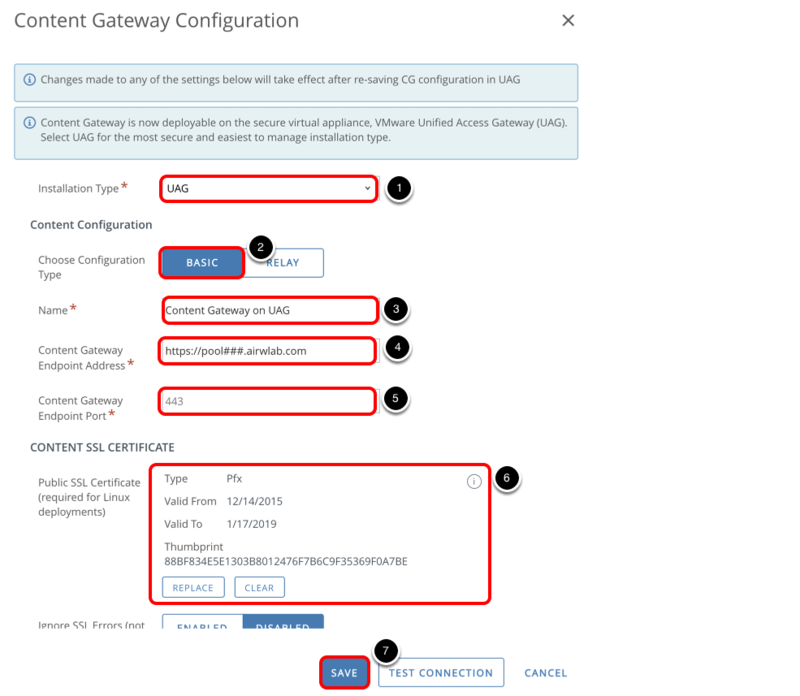 This section covers the required INI settings to enable the Content Gateway edge service during the Unified Access Gateway appliance deployment. Ensure you are logged in to the machine where you will install Unified Access Gateway. Extract the contents of the Unified Access Gateway ZIP file on this machine. 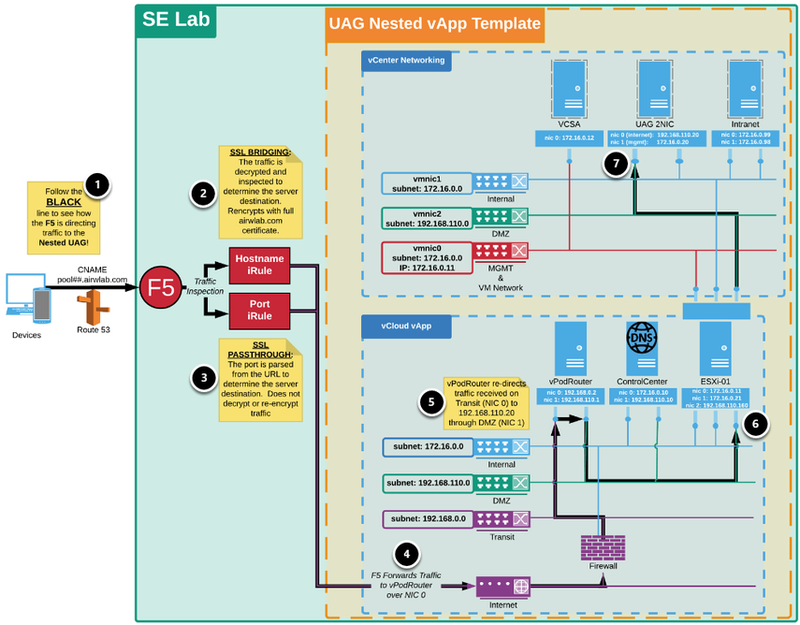 This exercise uses the uag-CG.ini file and is configured for a Unified Access Gateway appliance called UAG-CG, that has two NICs—NIC one is set to internet facing and NIC two for back end and management. Right-click the INI file, for example, uag-CG.ini. 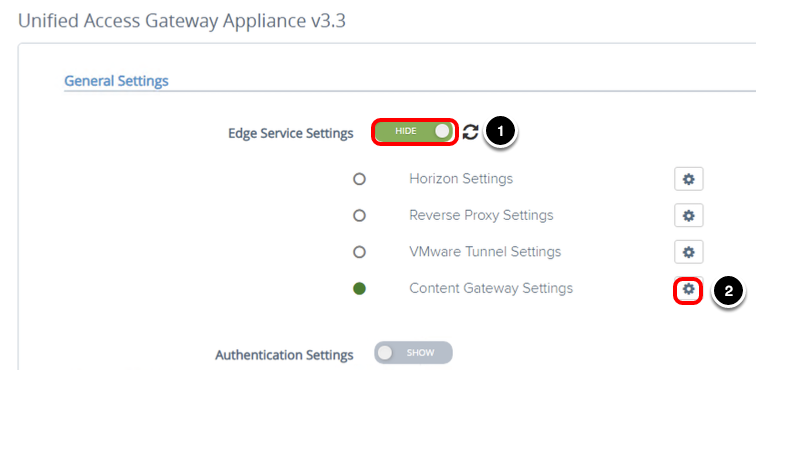 The AirWatchContentGateway section contains the required parameters to enable Content Gateway edge service on your Unified Access Gateway appliance. Paste the Content Gateway configuration GUID for cgConfigId. You copied this value in the previous exercise. Enter the apiServerPassword, for example, VMware1!. 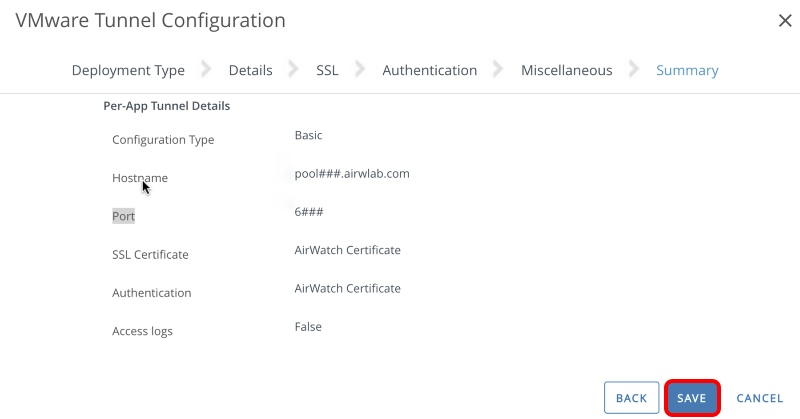 Enter the airwatchServerHostname, for example, https://pool###.airwlab.com. If you do not provide the apiServerPassword as part of the INI settings, the administrator must enter the password in the Unified Access Gateway administration console. Replace <password1> with the root password for the UAG appliance. After a successful deployment, the script automatically powers on the VM UAG-2NIC-CG. The Content Gateway is now enabled and running based on the INI settings that you provided during the Unified Access Gateway deployment. As an alternative to deploying the Content Gateway using PowerShell, you can use the Unified Access Gateway administration console, which allows you to enable or change the current Content Gateway settings. This section helps you to validate the Content Gateway settings using the Unified Access Gateway administration console. Click the gear icon next to Content Gateway Settings. The circle should be green, which means the Unified Access Gateway appliance and Workspace ONE UEM Console can communicate. The Content Gateway edge service is enabled based on the configuration defined in the INI file. Each time you change the configuration and Save, the changes are applied to the configuration files and the Content Gateway edge service restarts automatically. Devices cannot communicate with the service during the restart. To grant end-users access to corporate file servers from their devices and keep those files synchronized, IT administrators must configure an Admin repository, an Automatic user-added repository, or a Manual user-added repository. Workspace ONE UEM supports integration with various corporate file servers. The syncing method support and requirement of the Content Gateway component vary by repository type. Admin — A repository that is fully configured and synced by an administrator in the Workspace ONE UEM console. Automatic — A repository that is configured by an administrator in the Workspace ONE UEM console, but is synced by end users on their devices. 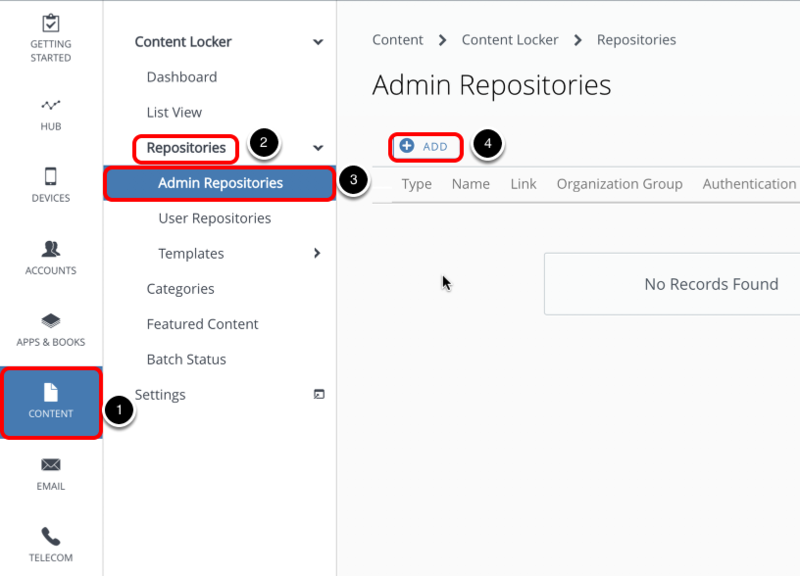 Manual — A repository that gets configured in the UEM console, but relies on the end user to add the link manually and sync the repository on their device. 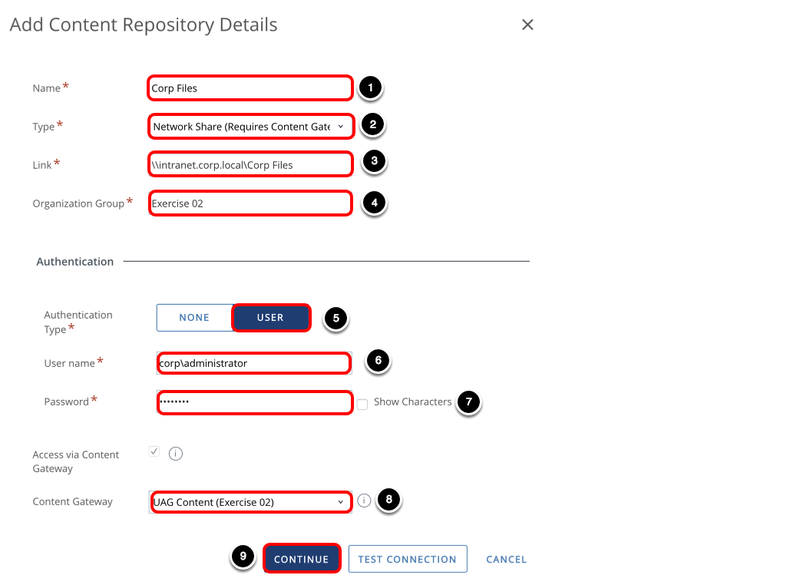 This exercise helps you to add a network file share as an Admin Repository and make that available to end users through the Workspace ONE Content application. In this example, the network file share is Corp Files. The folder and files names in your environment will differ. Enter a Name, for example, Corp Files. Select Network Share for Type. Enter the Link, for example, \\intranet.corp.local\Corp Files. Enter the Organization Group, for example, Exercise 02. Select USER for Authentication Type. Enter the User name, for example, corp\administrator. Select your Content Gateway, for example, Content Gateway on UAG. Access to this internal repository goes through the Content Gateway that you set up in the previous exercise. You can see the files available in this folder and in sync with Content Management. The Installed/Assigned column lists the number of devices where the files are available. Click the quantity to see a list of each device that can access the file. 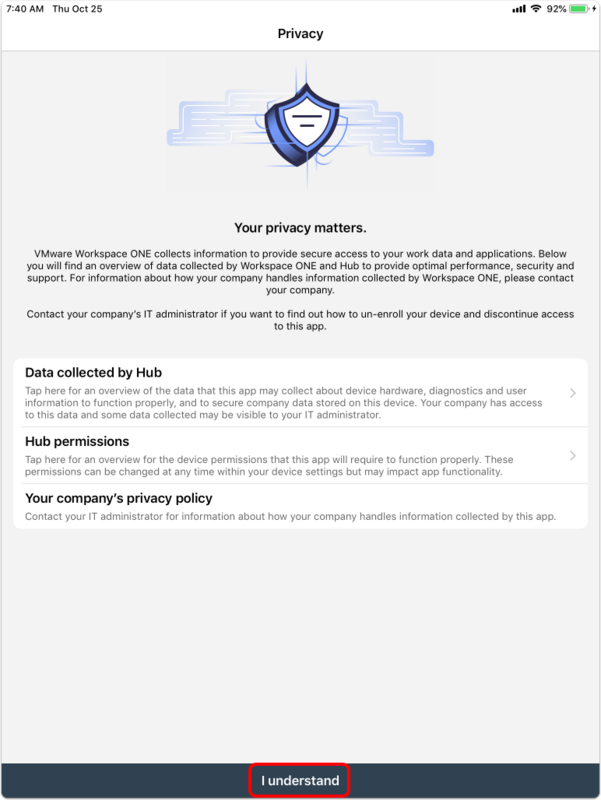 Although you configured the security configurations on the network file share, Workspace ONE UEM allows you to set up a new layer of security for the content on mobile devices. Navigate back to the Corp Files folder. Click Edit for one of your folders. There are a number of configurations that you can apply to increase security of the asset on the mobile devices. In this example, you edit security for the IT folder, however, you can override the security properties on multiple levels, such as navigating to a specific file. 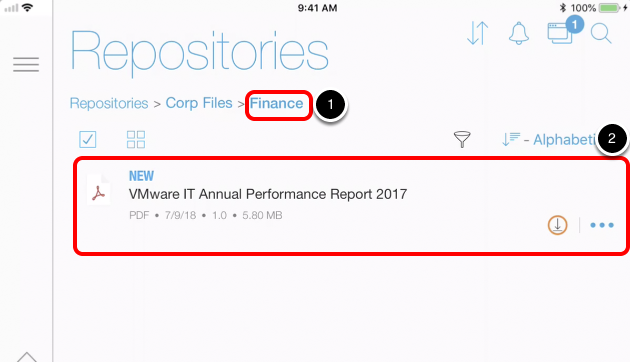 In this example, you allow the end-user to print any content under the IT Folder from a managed mobile device using Workspace ONE Content. Select the Allow Printing check box. 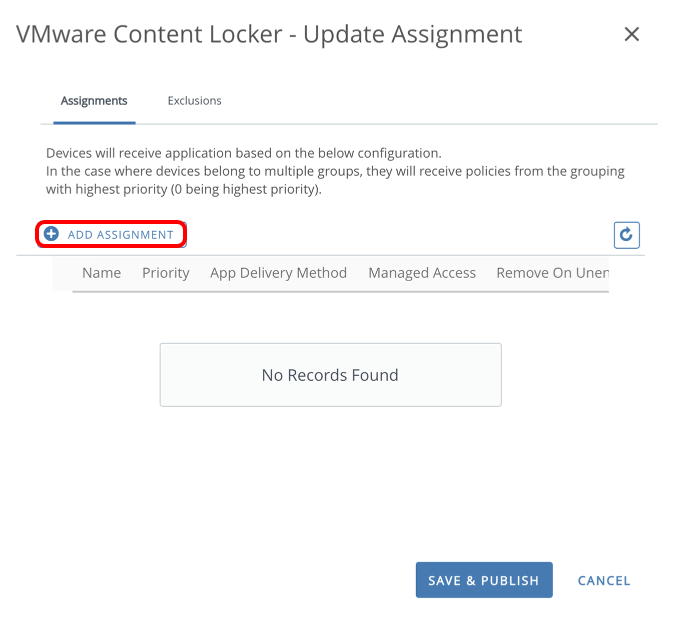 This exercise helps you to deploy the Workspace ONE Content (formerly Content Locker) application on a managed device from the Workspace ONE UEM Console. 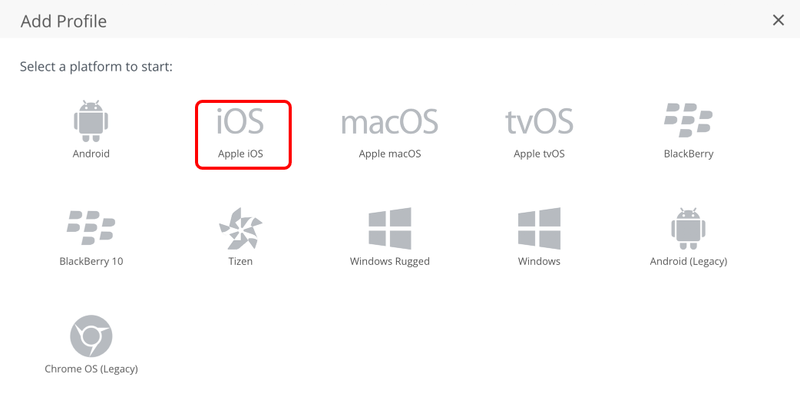 Select Apple iOS for Platform. Enter Content Locker for Name. Enter your assignment group, for example, Exercise 02. Click Save & Publish and then click Publish. 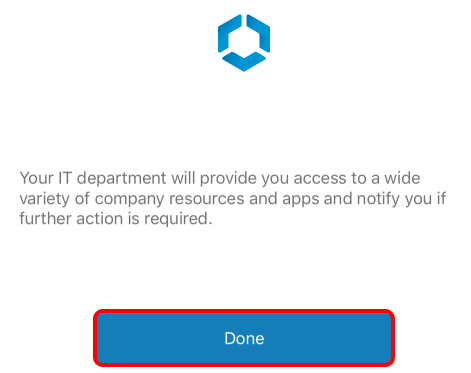 After you click Publish, you should receive a prompt on your device requesting confirmation to install the Workspace ONE Content application. Confirm and launch the application after the installation completes. 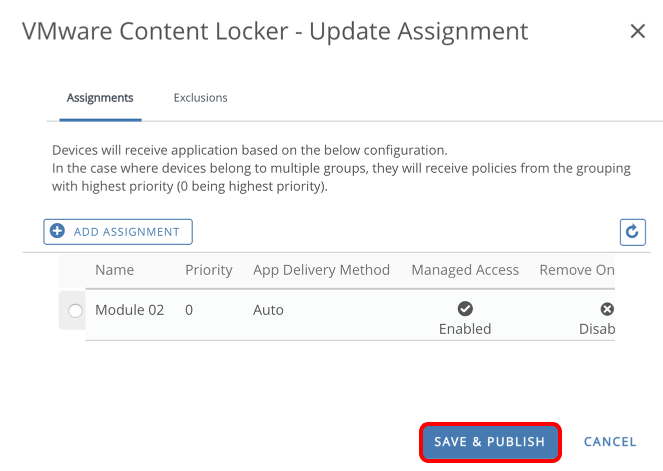 After enrollment is complete, ensure that the Workspace ONE Content application is installed on your device. 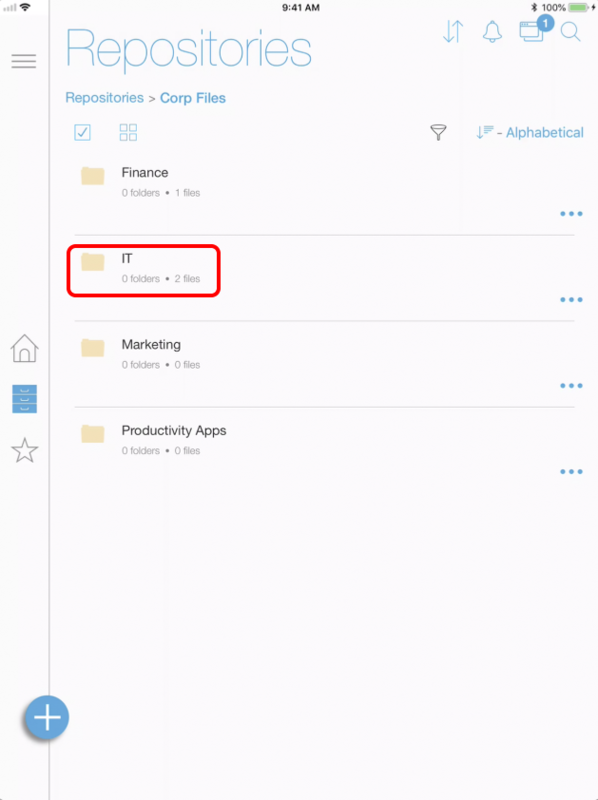 This section helps you to validate access to internal files using Workspace ONE Content. 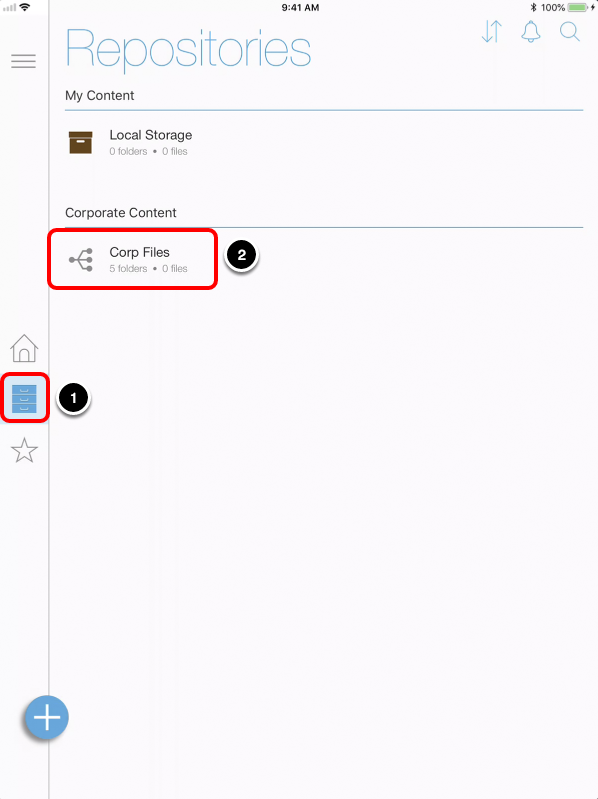 Tap Content to open Workspace ONE Content. Enter a User ID, for example, CORP\jdoe. Repeat the following steps for each folder you see under Corp Files. You can see the available files in each folder. Tap a file to open it. Tap the Share icon. The Print option is available based on the security properties previously defined for the IT folder. Tap < to return to Corp Files. Tap another folder in Corp Files, for example, Finance. The file is downloaded to your device and opened. Tap the Share icon. The Print option is not available for this file. 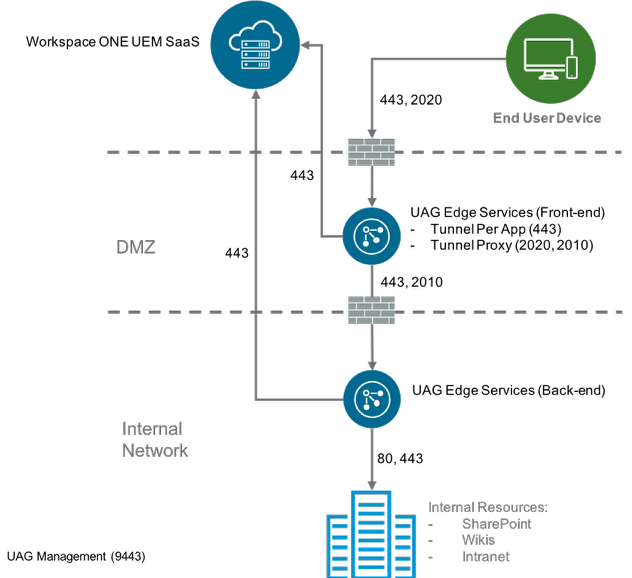 This operational tutorial provided steps to configure VMware Tunnel and Content Gateway edge services for Unified Access Gateway in a Workspace ONE UEM environment. A host that offers resources, tools, and applications to users and devices. Andreano Lanusse, End-User-Computing Staff Architect, Technical Marketing, VMware.